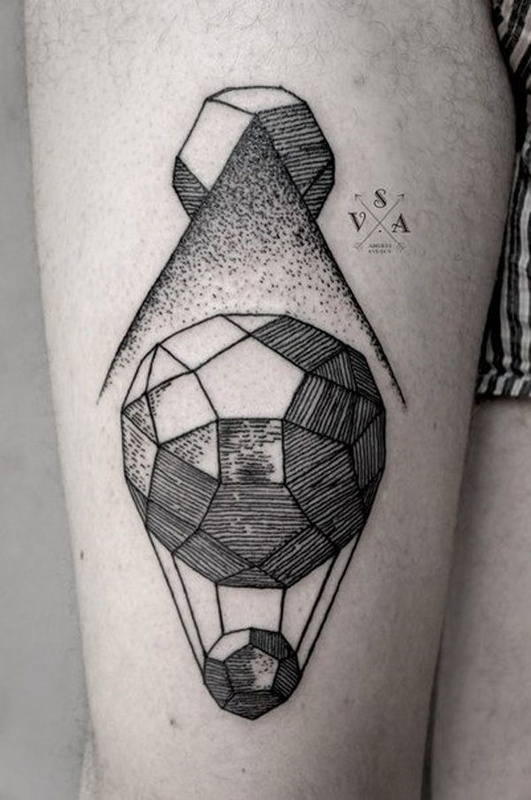 This article reviews 100 photos of tattoos that incorporate geometric shapes into the imagery. The pieces have varying color palettes and subject matter ranging from the purely abstract, to geometric interpretations of popular images. These images can be used as references, inspiration, or entertainment. Regardless of your intentions I hope you enjoy our compilation and tell us what you think of the articles in the comments section. 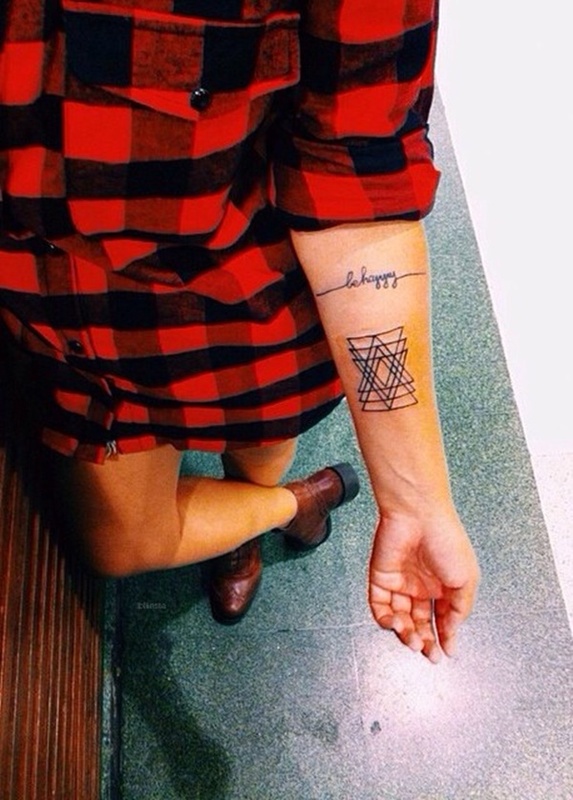 A series of geometric shapes is used to compose the shape of a leaf on the wearer’s forearm in this black tattoo. While some of the line work is shaky, the piece is busy enough to distract from the occasionally sub-par technique. 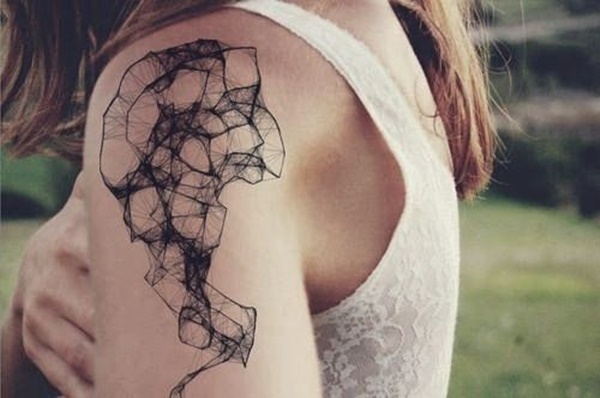 A series of lines starts at the wearer’s shoulder before swirling and overlapping down across the wearer’s chest and eventually ending near the wearer’s crotch. 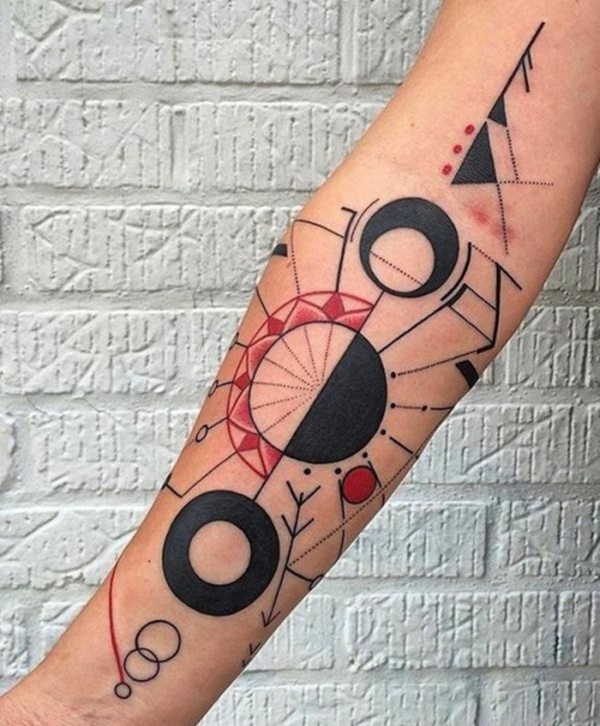 Circular shapes are insterspersed throughout a piece that utilizes black and red lines as pictured on the wearer’s forearm. 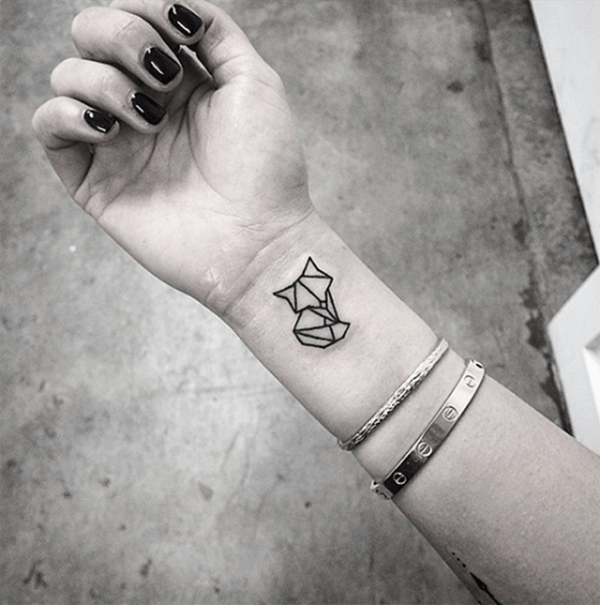 Bold, black lines are used to compose geometric shapes arranged into the shape of an adorably small curled-up fox on the wearer’s wrist. 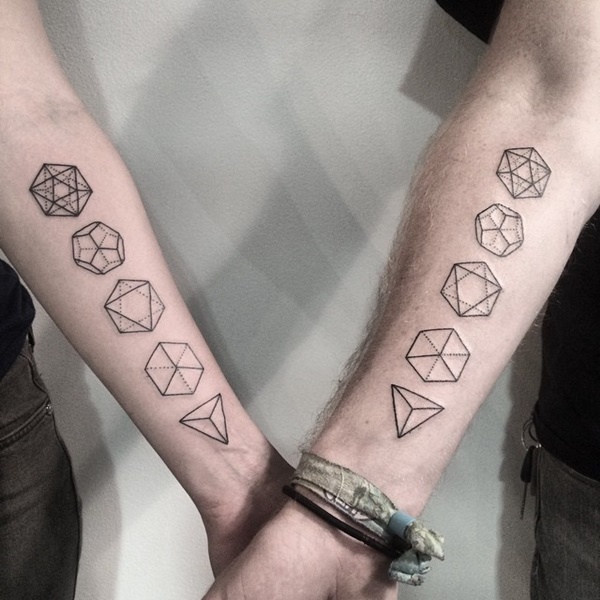 Dotted lines and diamond shapes are utilized to create the effect of a chandelier adorning the wearer’s chest in black ink. 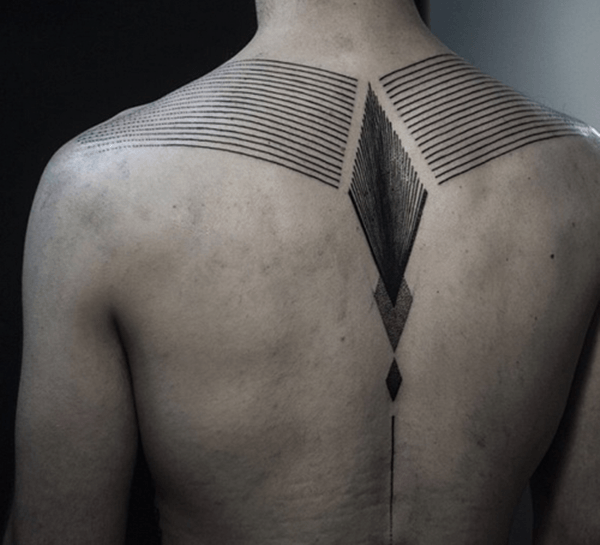 Black ink is used to create a series of lines running across the wearer’s shoulder blades and leading to a diamond shape adorning the wearer’s spine. The diamond shape is comprised of tightly grouped black lines and overlaps another diamond of similar composition before leading to a third, solid black, diamond and a black line. 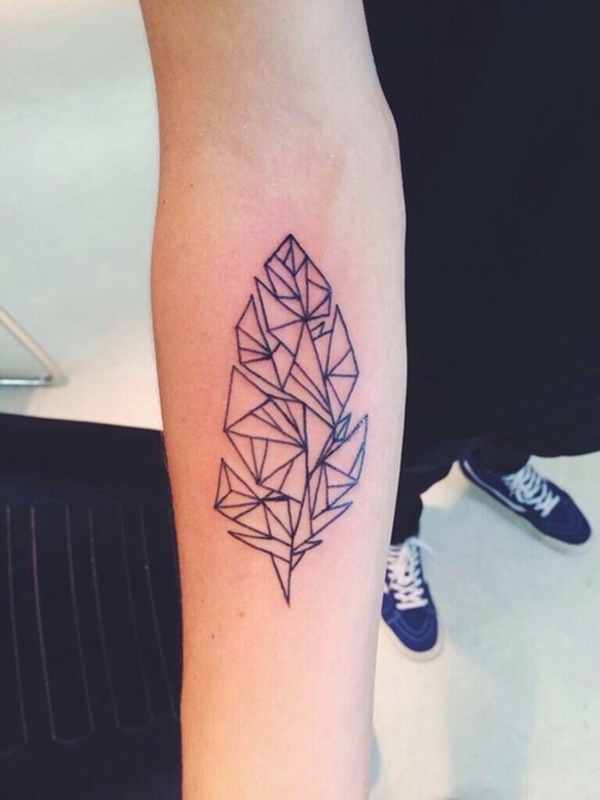 A flower is seen through a triangular prism in this imaginative tattoo. The petals are depicted as black around the edges of the triangle while the petals inside of the prism are depicted as white with black lines to add detail. A traditional Japanese depiction of a wave is encircled in the top of three circles. 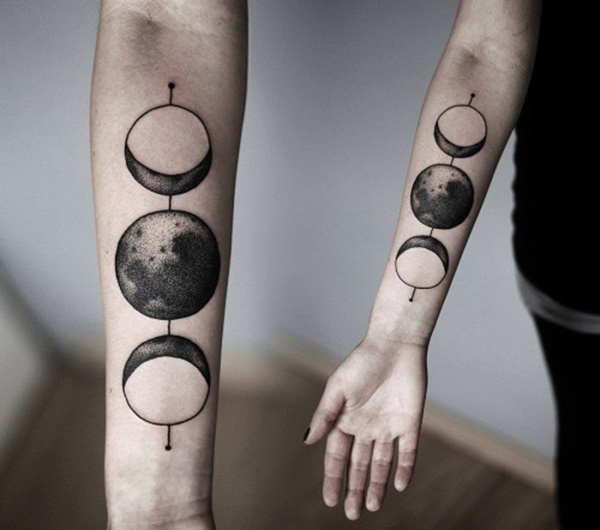 The circles are embellished with additional lines and shapes and the entire piece is comprised of black ink. 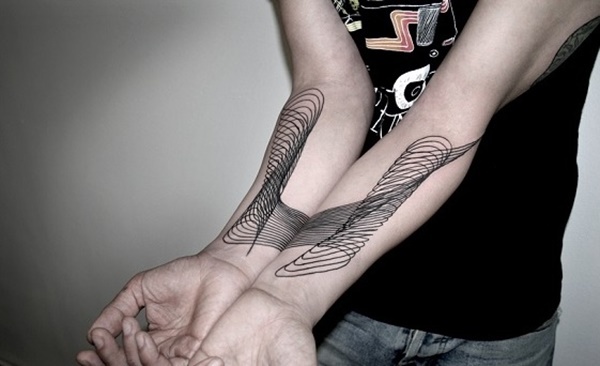 A series of black lines swirls into a single design when the wearer places their forearms together. 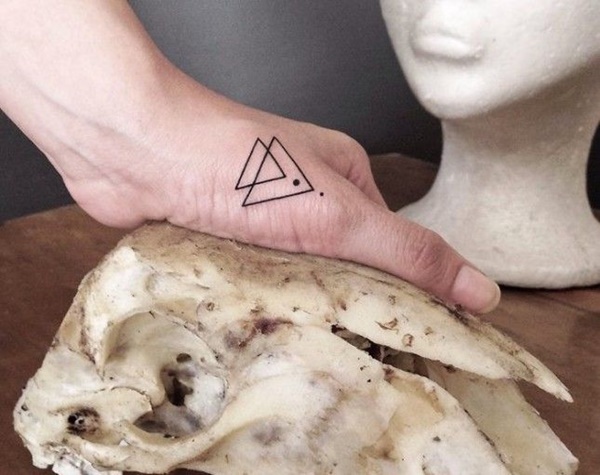 Very bold, black lines are used to create a triangle with a line running through the base farthest away from the point and is depicted on the wearer’s forearm. 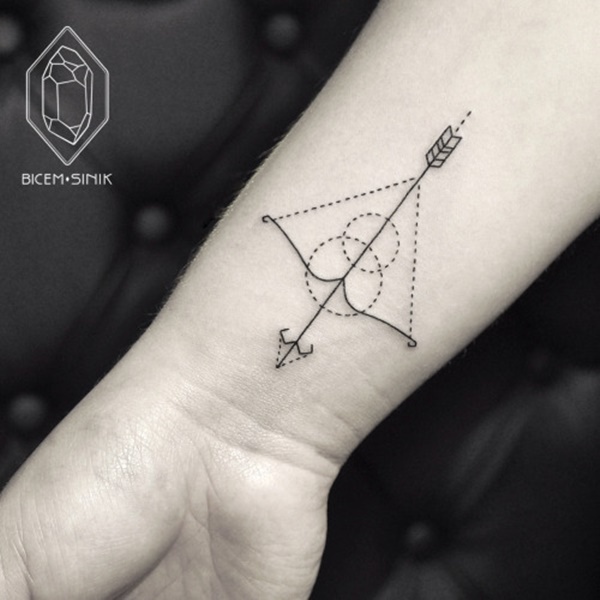 This simple piece shows a pair of arrows point in separate directions on the wearer’s bicep in this tattoo. A myriad of geometric designs are incorporated into this black and gray piece that reminds of the pattern on an ugly Christmas sweater. 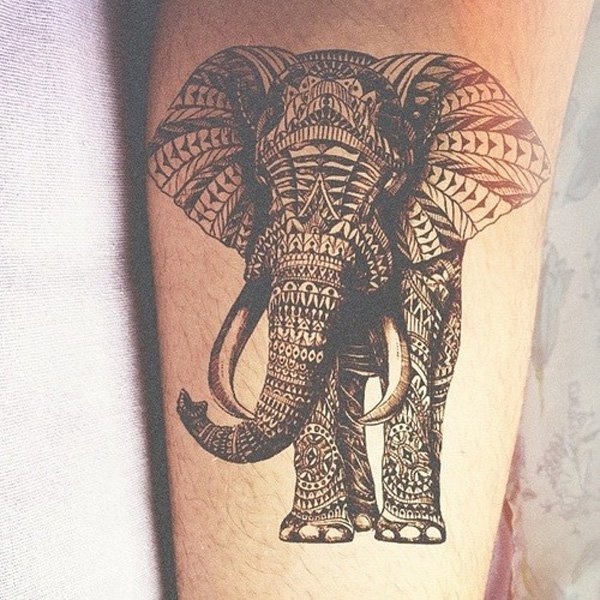 A hyper-detailed elephant is covered in a mandala pattern in this incredibly well executed black and gray tattoo. 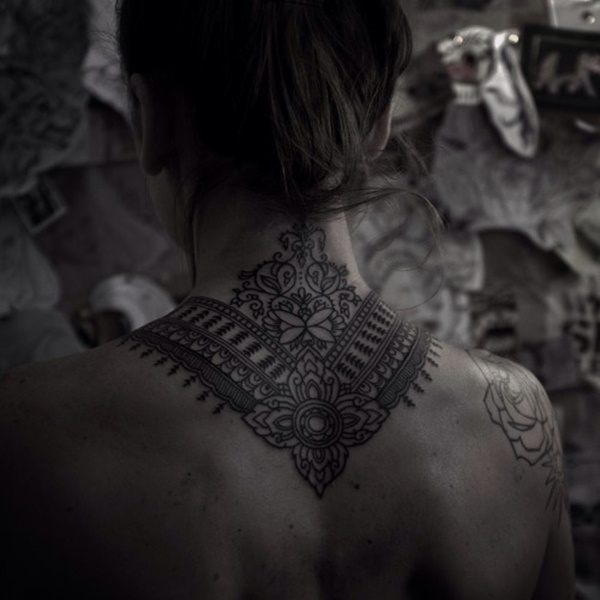 Three blacked out blocks adorn the wearer’s spine just beneath the base of the neck. 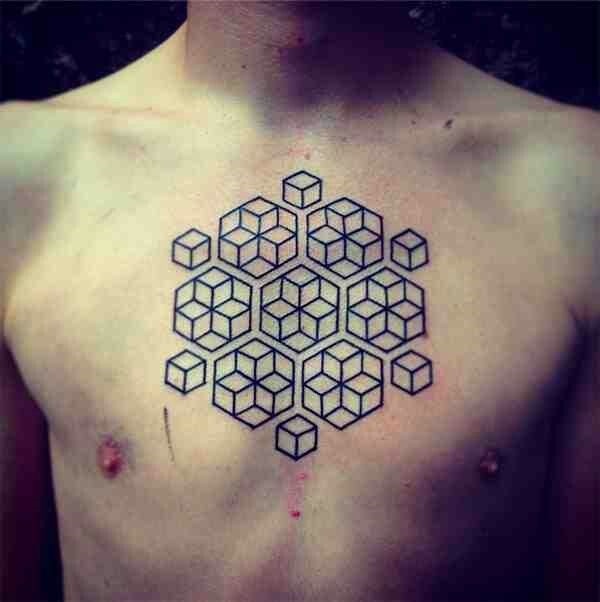 Tight line work is used to create a series of cubes out of hexagonal shapes. 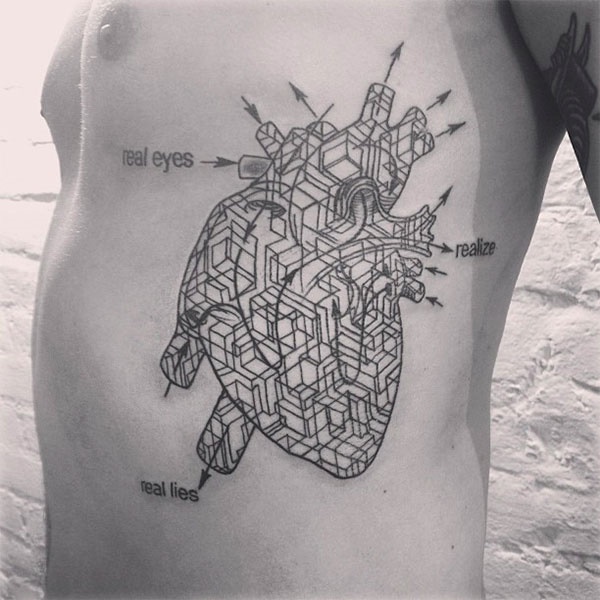 The tattoo is composed using black ink and is centered on the wearer’s chest. A series of diamonds is created using black dots that create a translucent effect as the shapes overlap. Tightly compacted black lines are contained inside of a lopsided geometric shape. The lines are raised toward the right side of the piece and give the effect of a topographical map used to represent the elevation of an area. 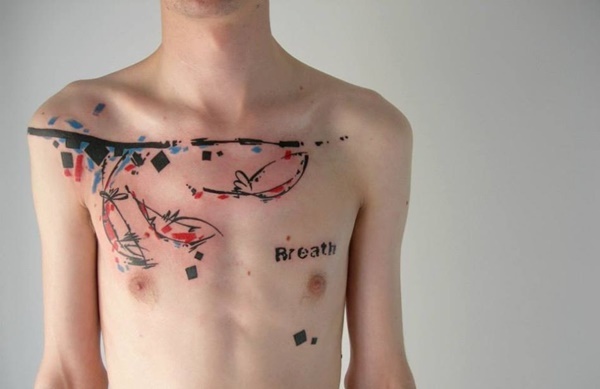 Blue, red, and black ink is used to create an abstract piece that incorporates images of feathers and the word, “Breath,” into the design. 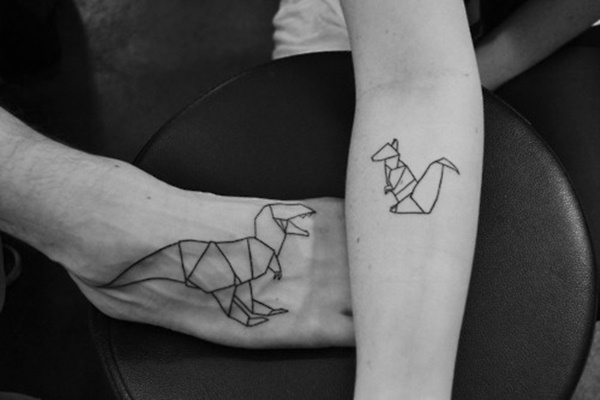 Origami interpretations of a Tyrannosaurus Rex and Kangaroo are pictured on the wearer’s foot and forearm respectively. 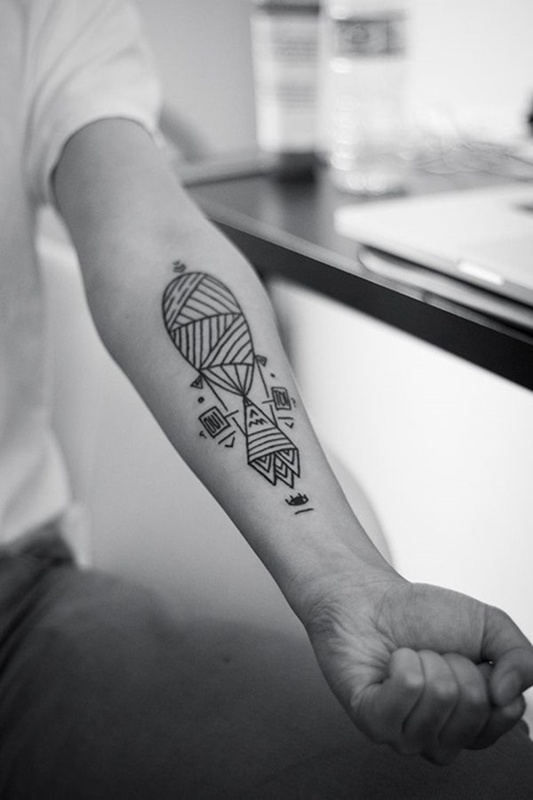 This obscure tattoo uses traditional Mexican styling to create a hot air balloon in bold, black lines. The balloon is holding a conical shape that is being propelled by flames shooting from the bottom. 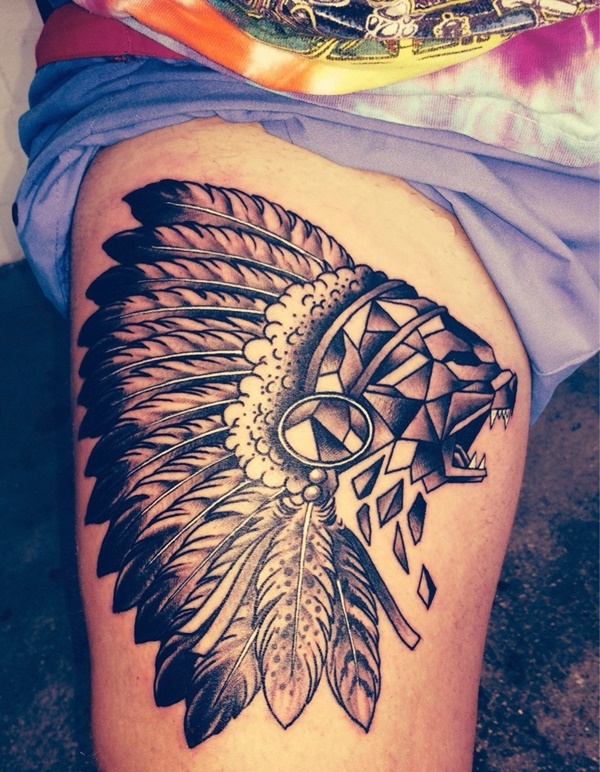 Arrowheads and diamond shapes create an image that is obviously inspired by southwestern Native American art. 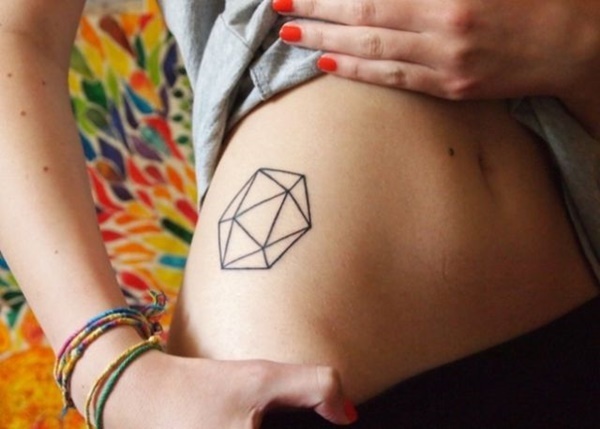 A shape reminiscent of a multi-sided die used in the popular board game Dungeons & Dragons is depicted in black ink on the wearer’s hip. 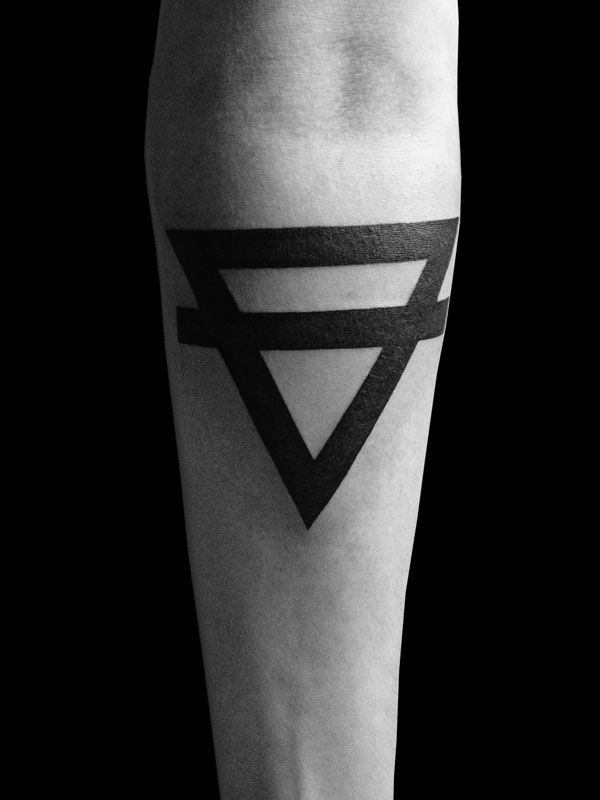 A triangle is embellished with diagonal lines and circles and is pictured on the wearer’s lower back above the tailbone. 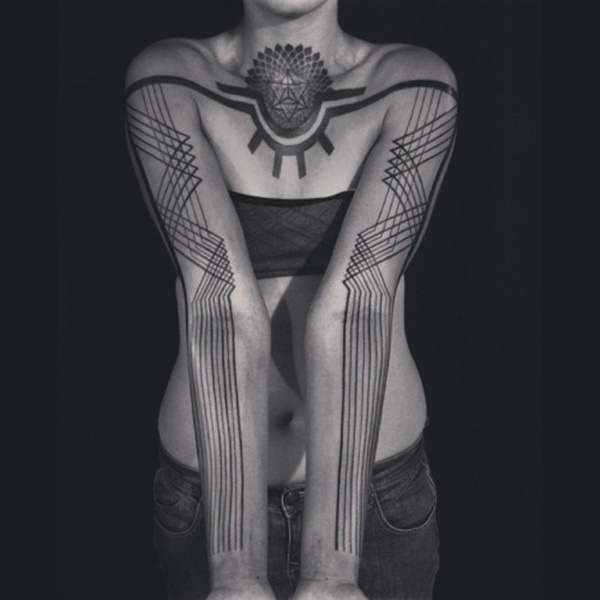 Once again, we see Native imagery paired with geometric shapes in this black rib piece. 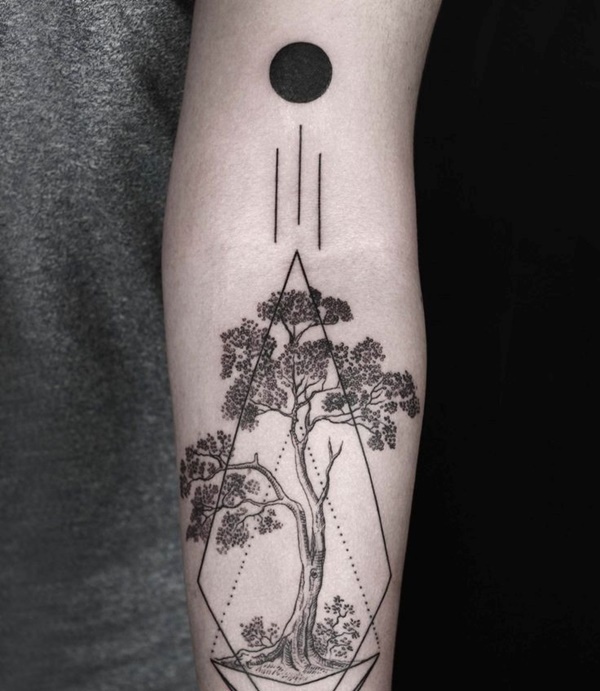 This black and gray piece shows a tree framed by a diamond shape and at the top of the diamond three lines lead to a blacked out circle. Multi-faceted shapes resembling gemstones are attached by lines and sit underneath a triangular shape that is colored with black dots. 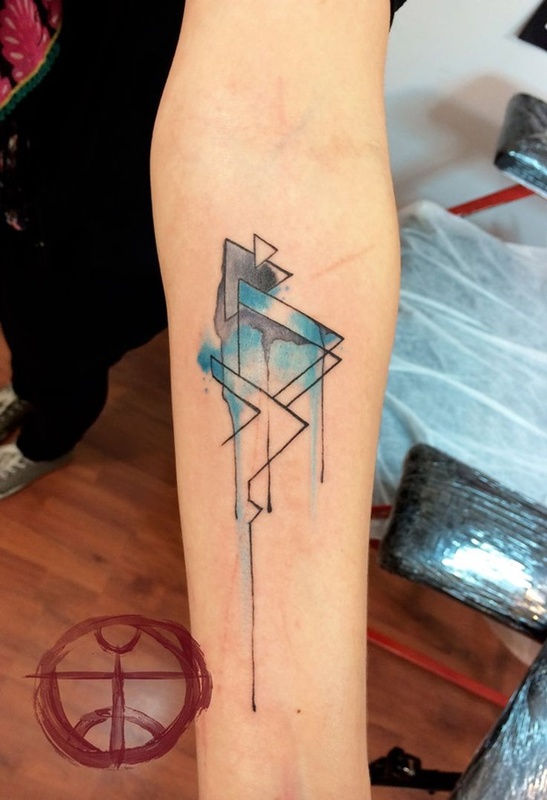 Triangle shapes pointing to the side are colored in blue and black in an imitation watercolor style. 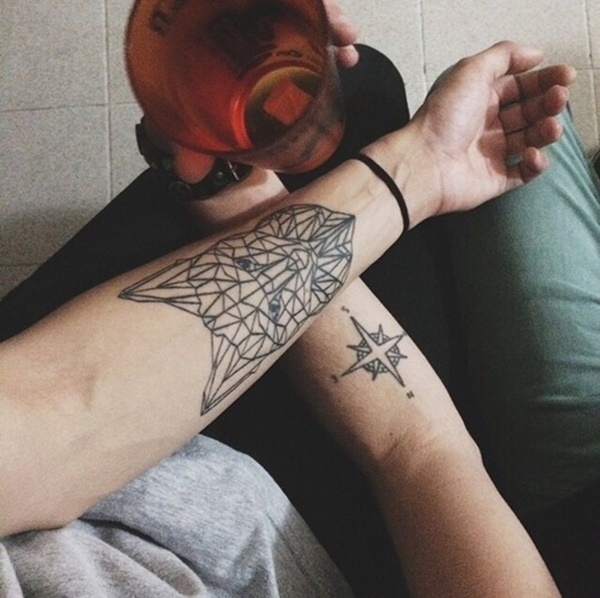 The tattoo is located on the wearer’s forearm and the colors and some of the lines run down the arm toward the wearer’s wrist. 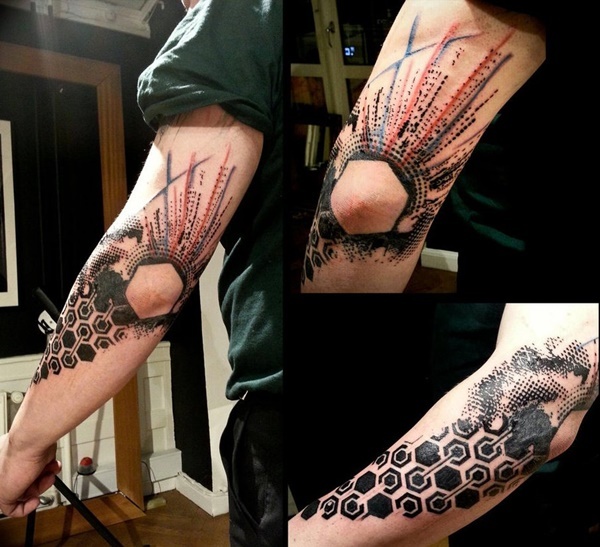 This stunning tattoo shows a succession of arrows descending down the wearer’s forearm. The arrows become increasingly darker as they near the wearer’s wrist and this subtle detail creates an appealing sense of complexity. 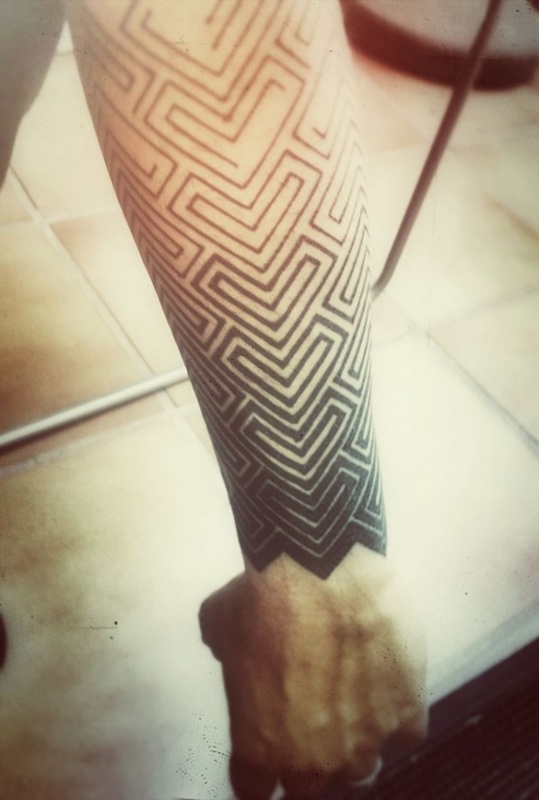 A series of precisely drawn black squares overlap on the wearer’s forearm. 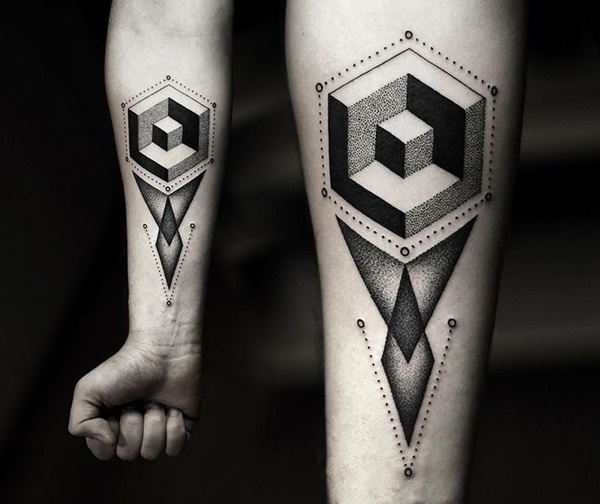 This black and gray forearm piece shows a cube inside of a larger cube and the piece is embellished with additional geometric shapes and dots. 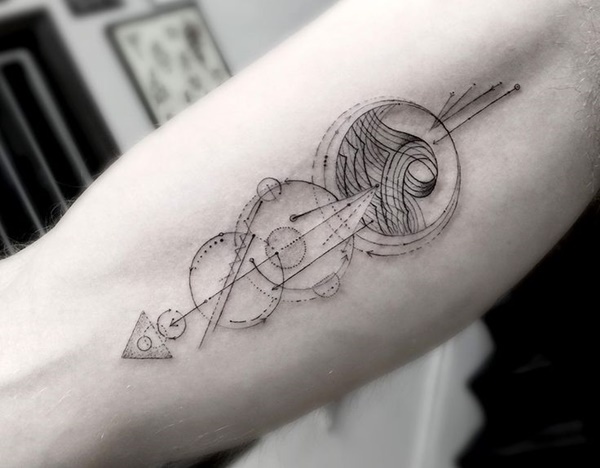 This tattoo pictures a crop circle using black and white ink. 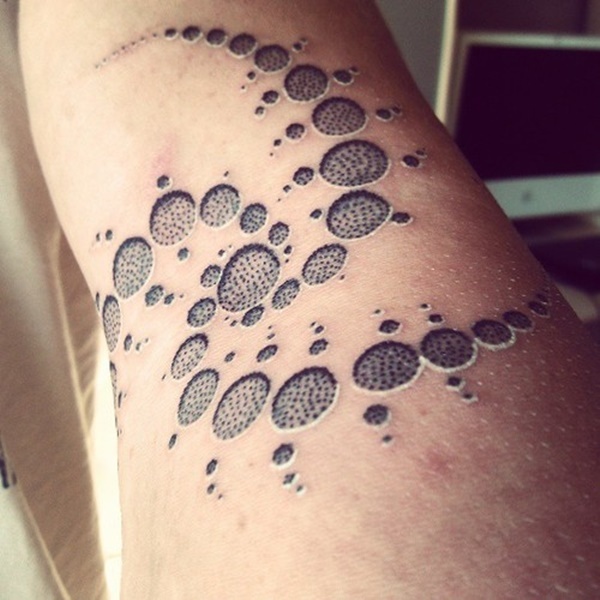 The circles are positioned in a swirling pattern and the outskirts of the circles are highlighted with white ink. 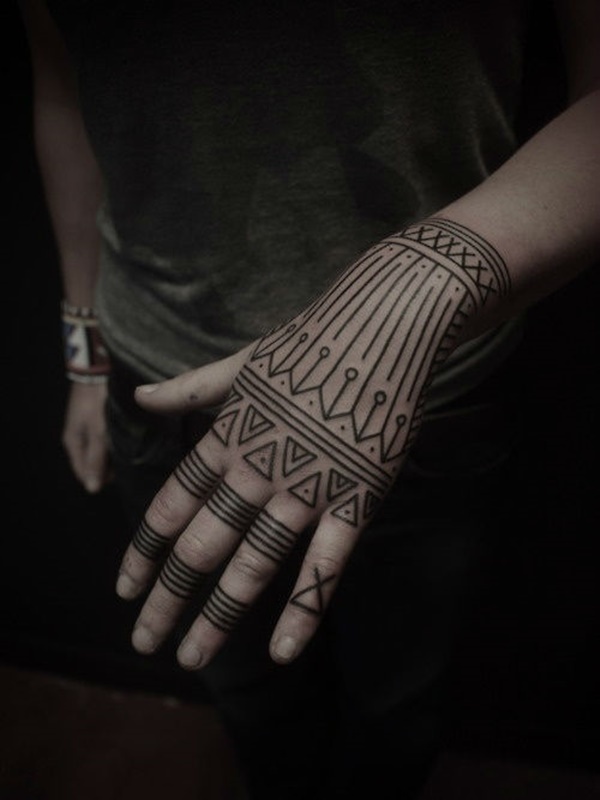 Illustrated on the wearer’s hand, this tattoo shows a pair of overlapping triangles detailed with a pair of black dots. 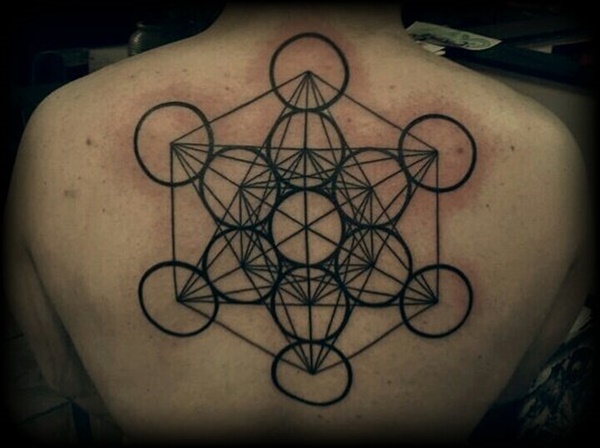 The Celtic symbol the Triqueta is pictured in the middle of this design that overlaps multiple circles to create the image. 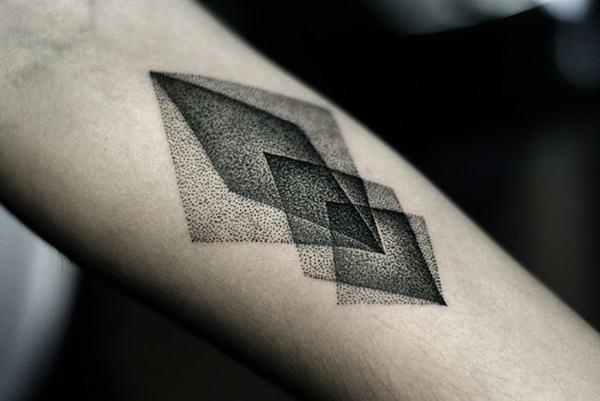 Overlapping shapes create a 3-D image pictured in black ink on the wearer’s forearm. 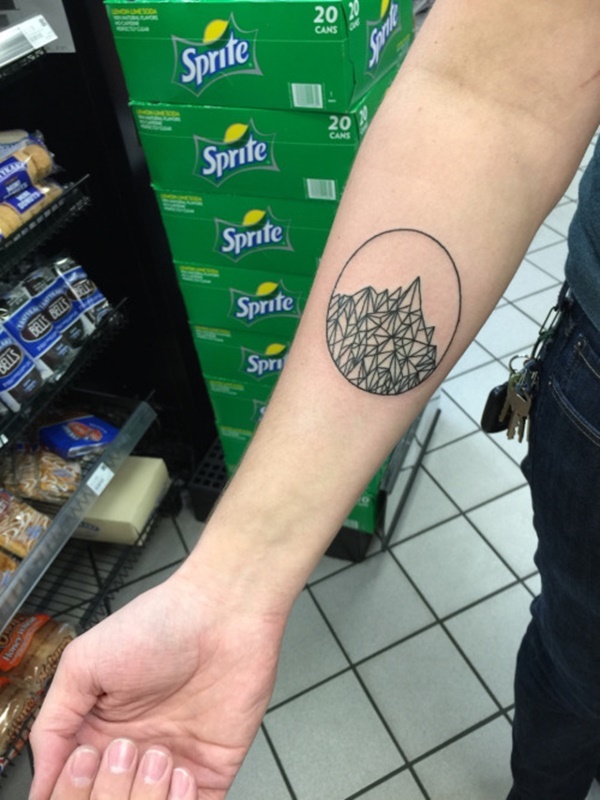 A black and gray wolf is depicted using geometric shapes and is embellished with lines and dots. 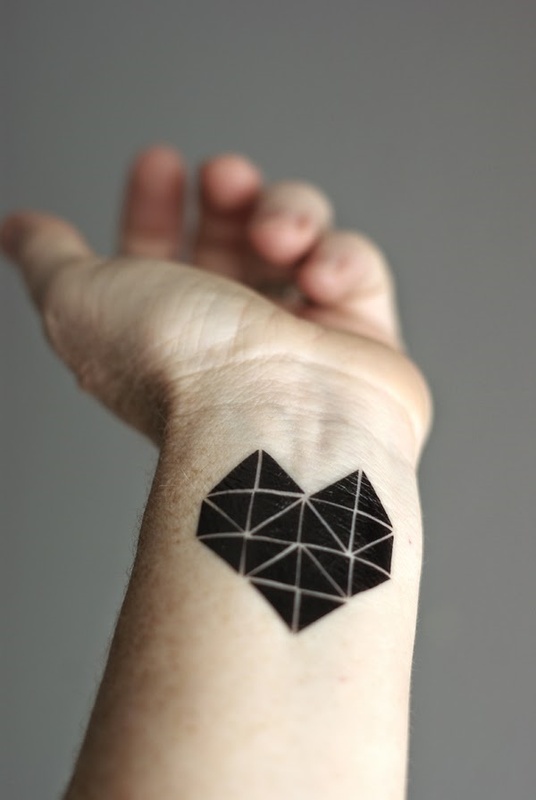 Black triangles are used to create the shape of a pointed heart. 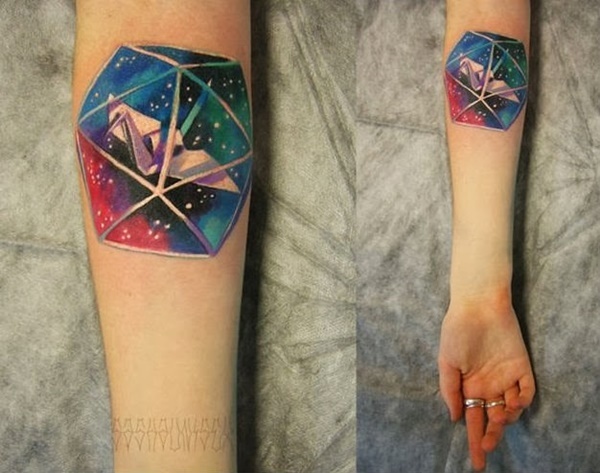 An origami swan is encapsulated inside a 3-D hexagon and surrounded by cosmic bodies. 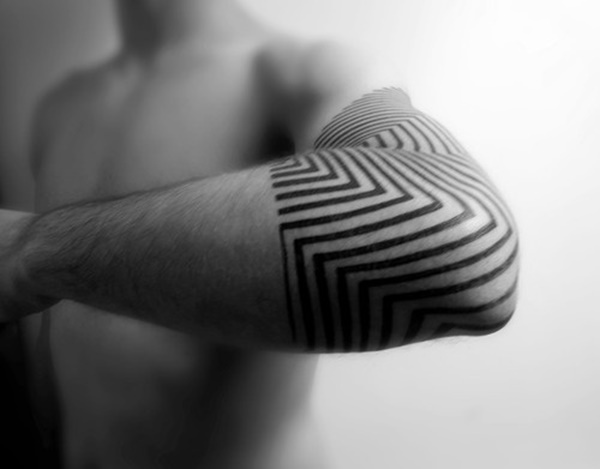 Softly applied black lines overlap to create an abstract image on the wearer’s bicep in this piece. 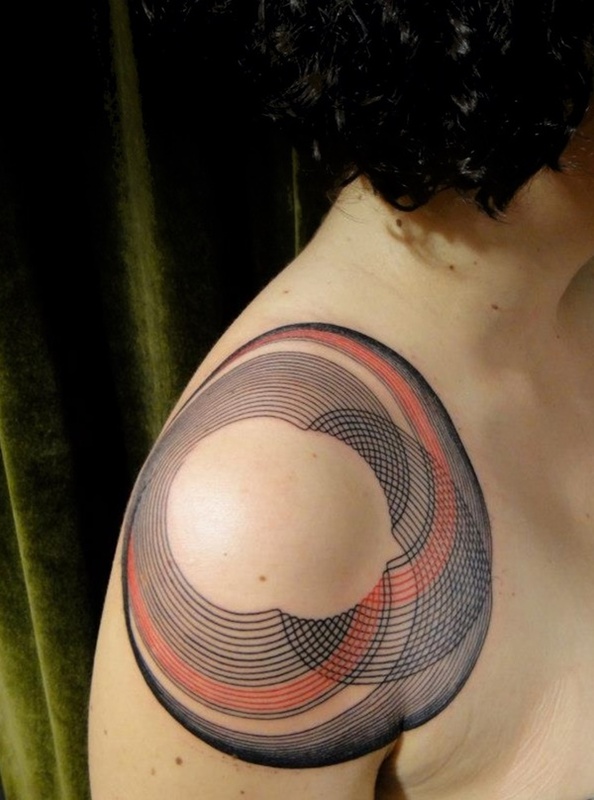 Black and red lines wrap around the wearer’s shoulder and overlap to make a design around the point. 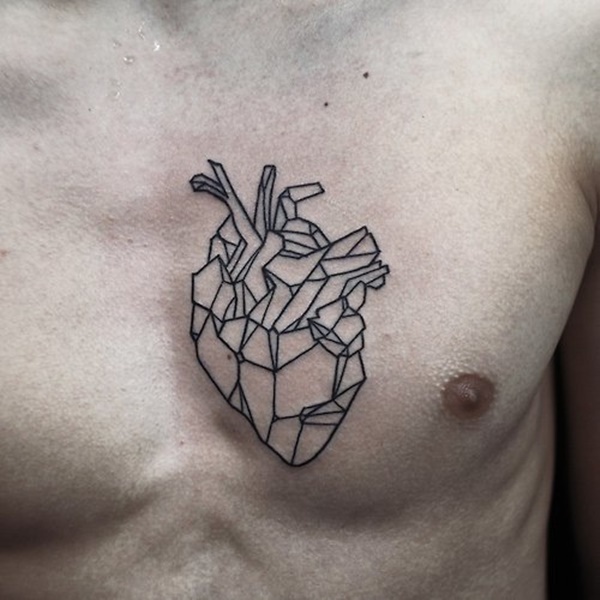 A realistic heart is created by combining geometric shapes and is pictured on the left side of the wearer’s chest over his actual heart. A plethora of shapes is used to cover the wearer’s hand like a glove. 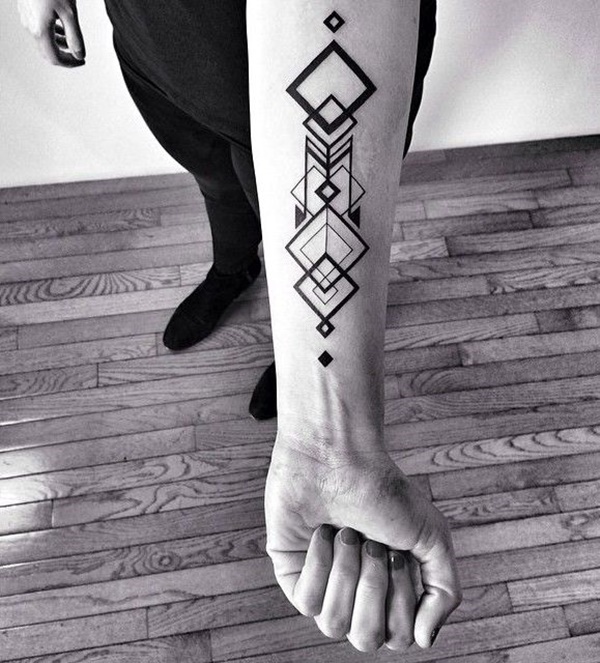 The piece utilizes triangular, circular, and linear shapes to create a bold, black tattoo. 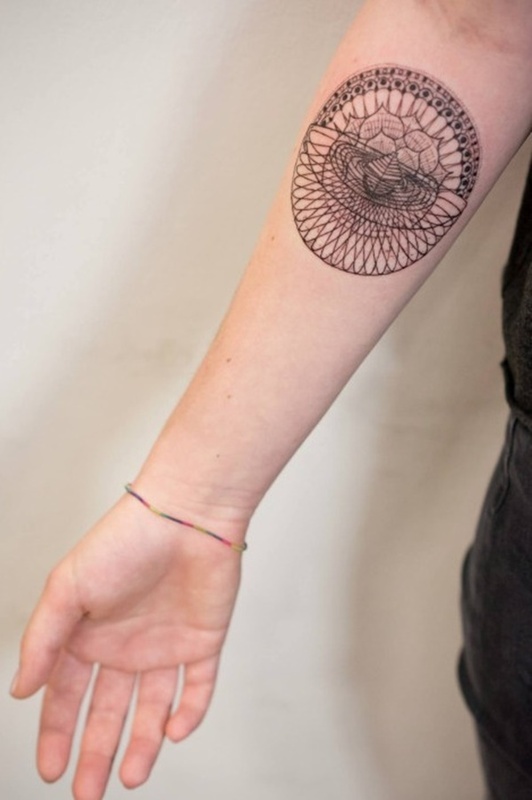 A lotus flower design sits in the center of crossed lines that lead into flower petal shapes in this forearm tattoo. 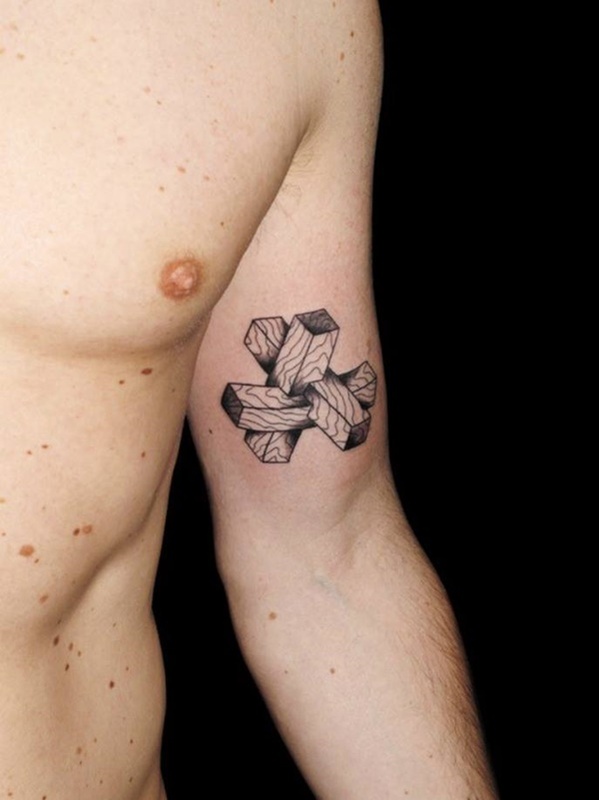 Three interlocking wood beams are depicted in black ink on the wearer’s bicep in this somewhat confusing tattoo. 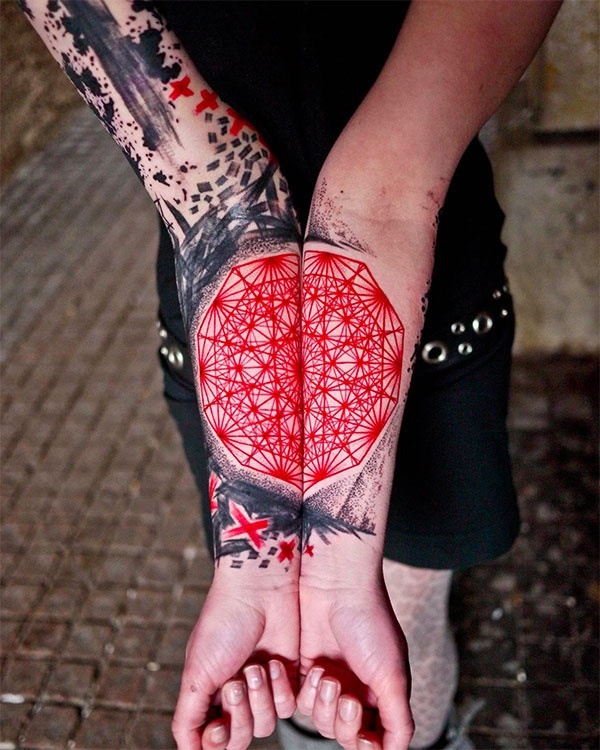 Bold, red lines are used to create a decagonal design that resembles a Ferris wheel on the wearer’s forearms. 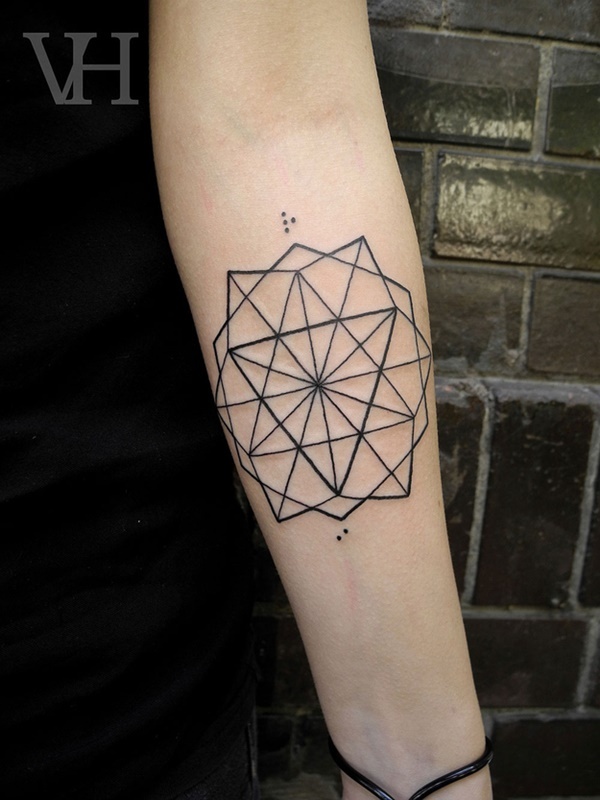 A black hexagon is embellished with interior line work and circles that surround the points of the shape. This matching set shows a series of shapes deconstructed into a triangle with interior lines. 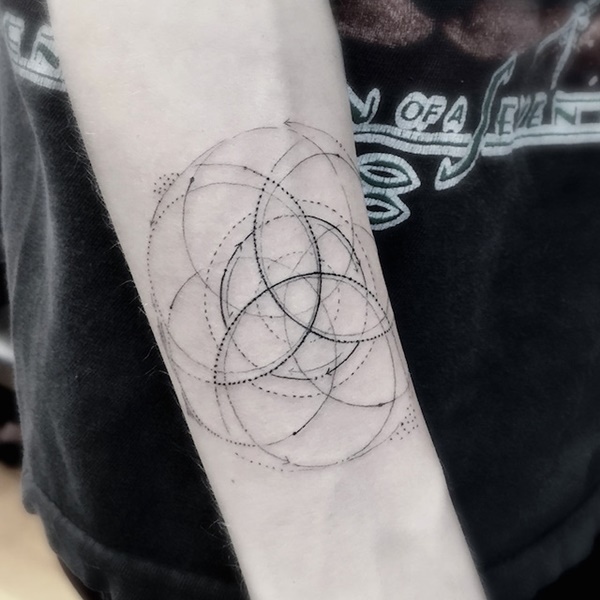 A circular design surrounds the wearer’s shoulder and leads to a series of dots that become progressively smaller as they lead away from the center design. 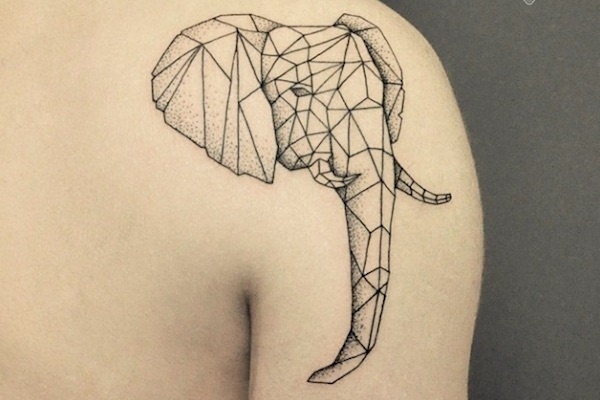 An elephant head is created using a myriad of geometric shapes in this black and gray tattoo pictured on the wearer’s bicep. 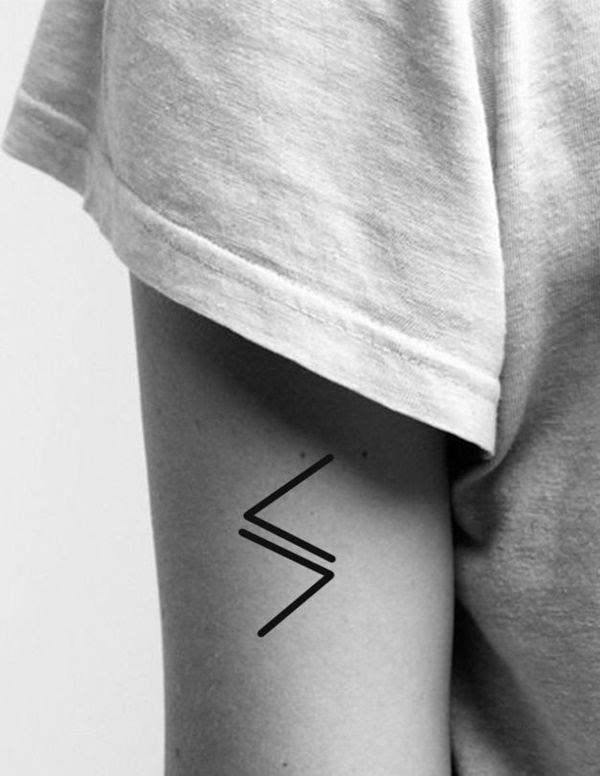 Zig-zagging black lines adorn the wearer’s elbow in this simple, yet pronounced, piece. 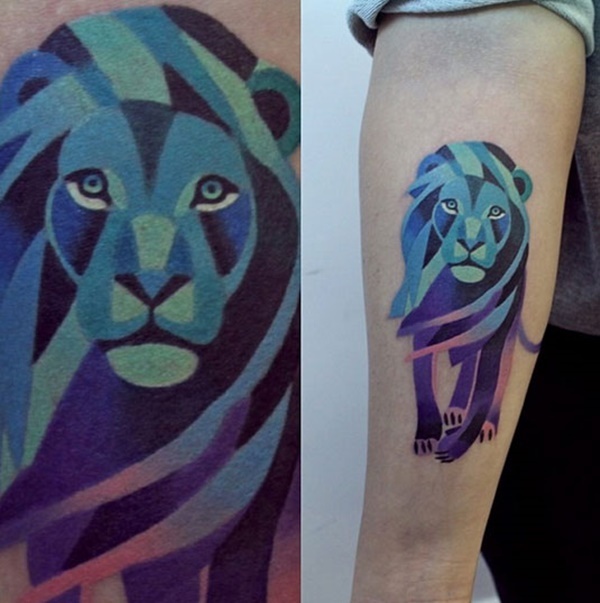 This tattoo, reminiscent of a stained glass window, depicts a lion in a blue and purple color palette on the wearer’s forearm. 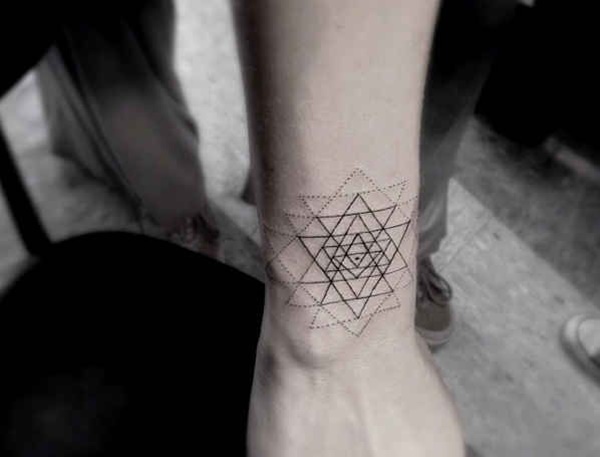 This tattoo sports a triangle in the center that is surrounded by overlapping triangles that use solid and perforated lines. 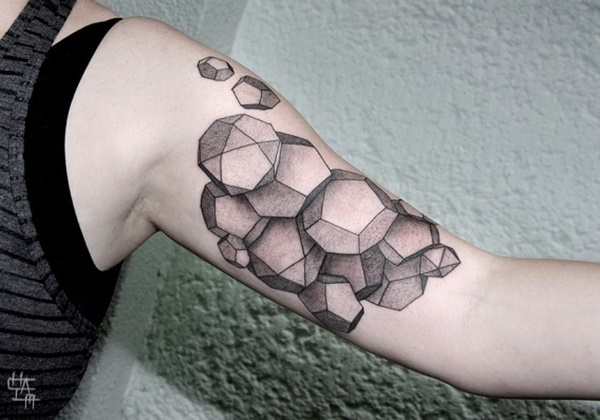 A cluster of gemstones is depicted in black and gray on the wearer’s bicep in this photo. This black tattoo, depicted on the wearer’s stomach, shows a moth at the top of a kite shape that is embellished with additional shapes. 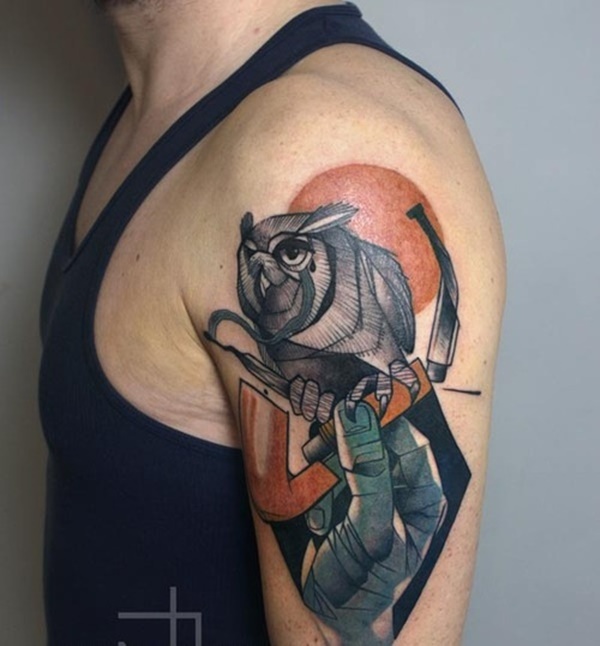 This incredibly well-done bicep piece depicts an owl perching upon a smoking pipe held by a disembodied hand with the sun shown distinctly in the background. 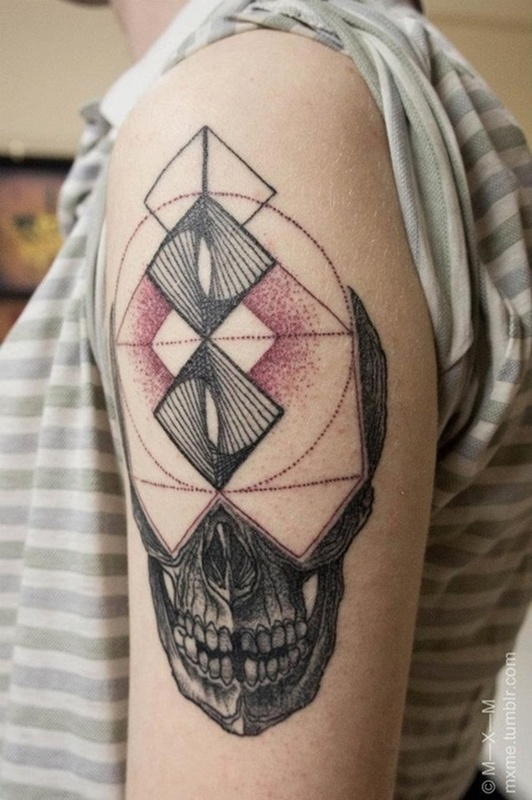 This bicep tattoo shows the lower half of a skull in black and gray while the upper half is dominated by geometric shapes in black and maroon ink. 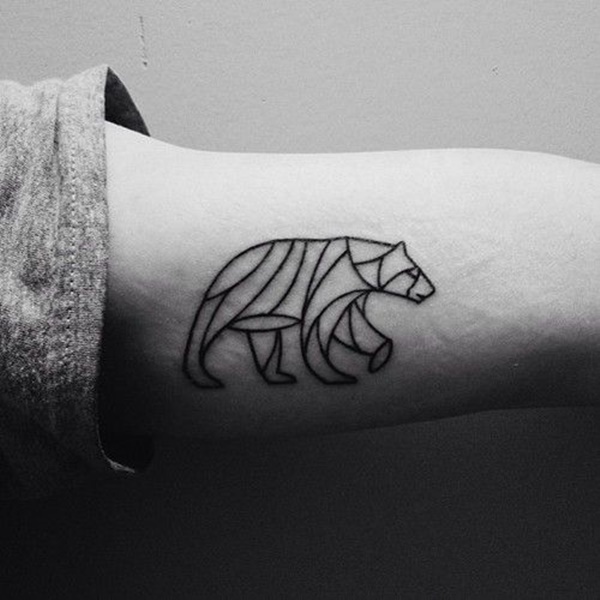 Precise, black lines are used to create a rough outline of a foxes head on the wearer’s forearm. 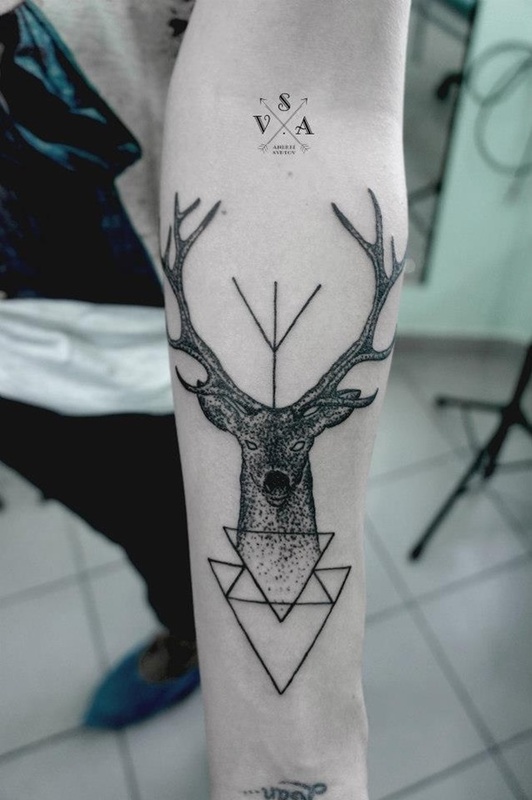 A whitetail buck is shown with triangle shapes near the base of the creatures neck and lines embellishing the top of the animal’s head. 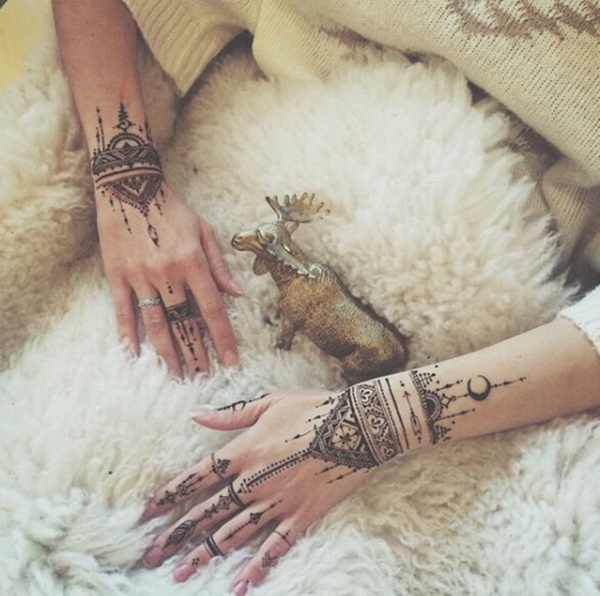 The antlers and head are colored with black dots and add a sense of texture. A repeating hexagon pattern is embellished with dots and blue and red smears of color. 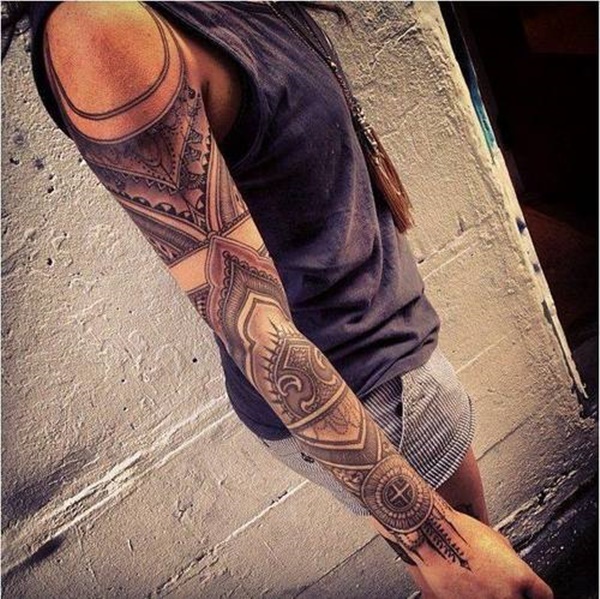 The piece is depicted on the wearer’s elbow. 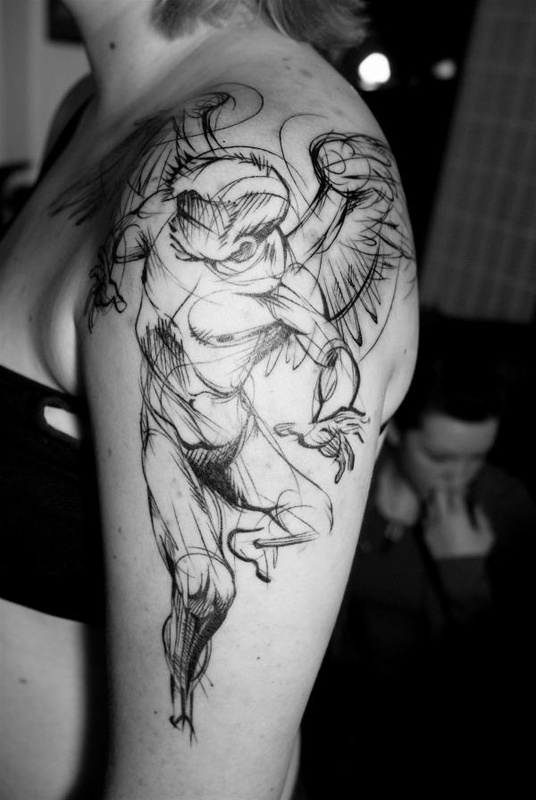 An angel, devoid of genitalia, is pictured on the wearer’s bicep in a style that imitates the rough sketch of an artist. Shapes with prominent curvatures are used to create the shape of a bear mid-step. A planet is represented fully intact in the middle of two halves of a planet and a line connects the three pieces. Subtle shades of red is used to highlight this elaborately patterned black and gray sleeve. 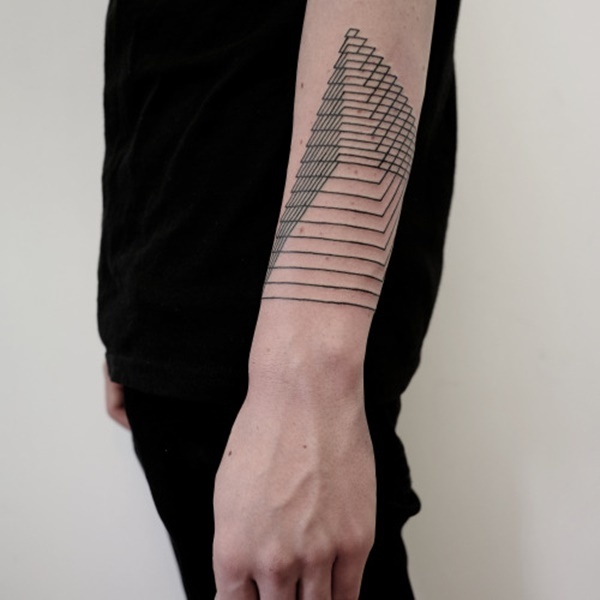 2-D square shapes of varying size are stacked over top of one another along the wearer’s forearm, the entire tattoo is created using black ink. 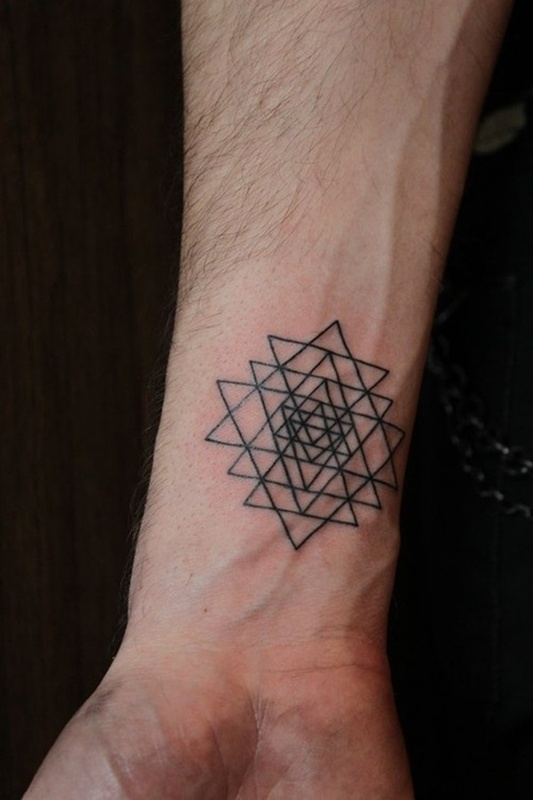 Multiple triangles are stacked on top of one another to create the intriguing image shown on the wearer’s wrist. 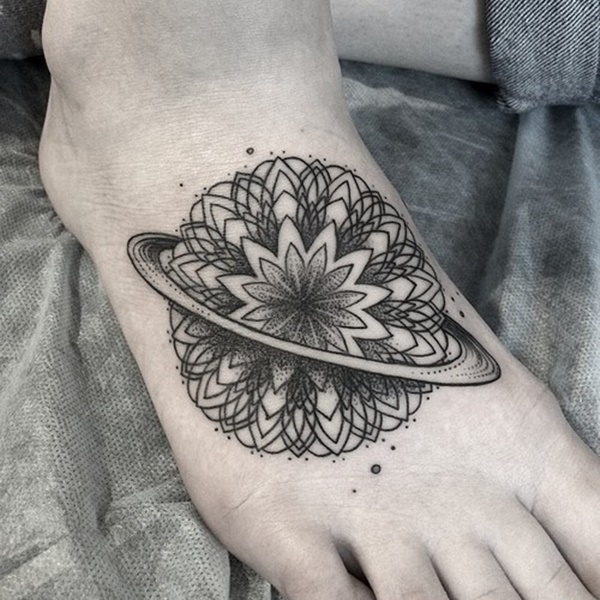 A flower is located in the middle of overlapping swirling patterns and a ring wraps around the entire design to create an image reminiscent of the planet Saturn. 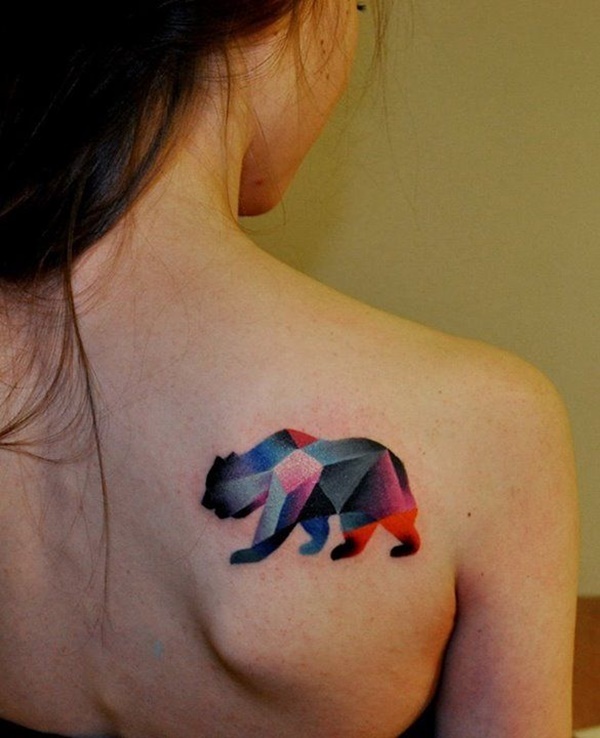 A vivid color palette is used to enliven this image of a multi-faceted bear on the wearer’s right shoulder blade. 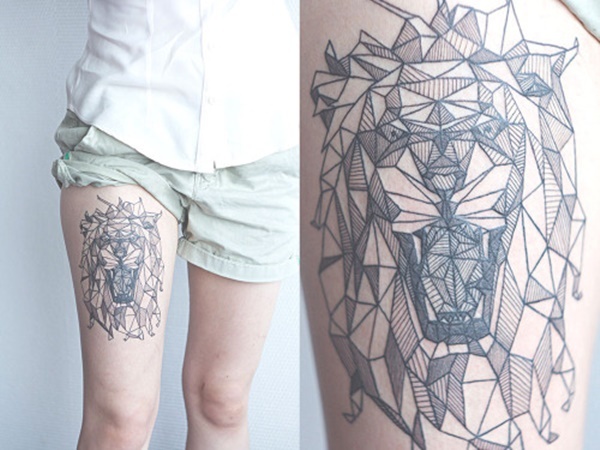 Black ink and geometric shapes compose the a lion on the wearer’s right thigh. 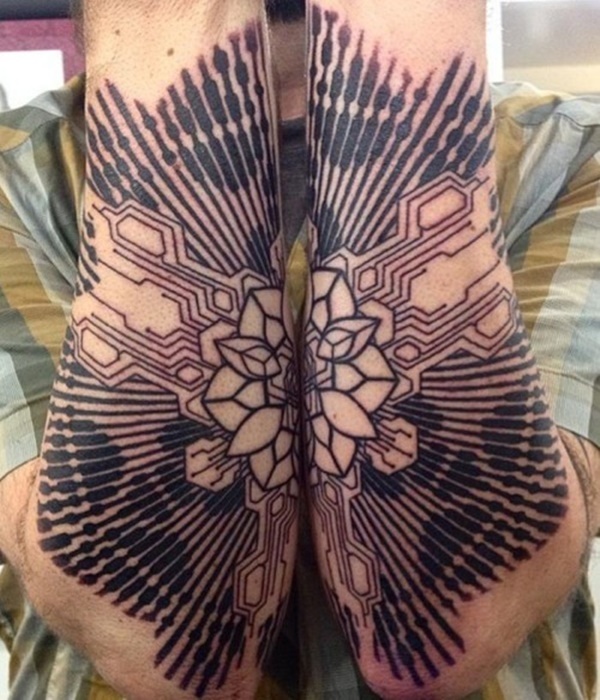 Lines are used to add details to the facets and add a sense of complexity. 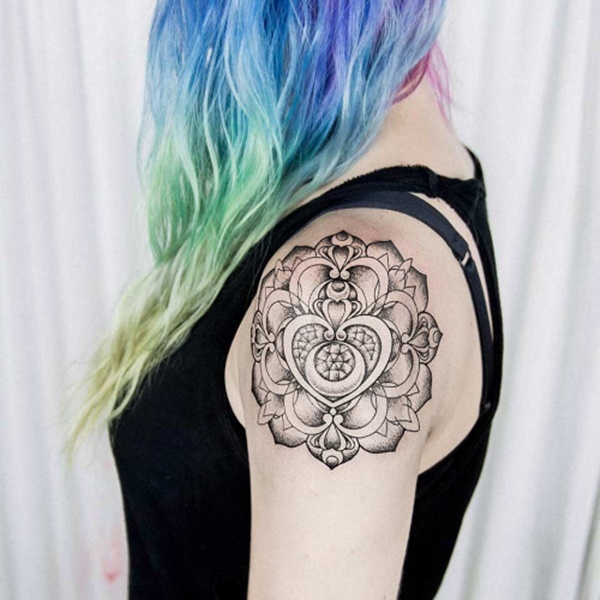 Depicted on the wearer’s forearms this tattoo shows a lotus flower shape comprised of red ink in the center surrounded by ornate black and gray petals. 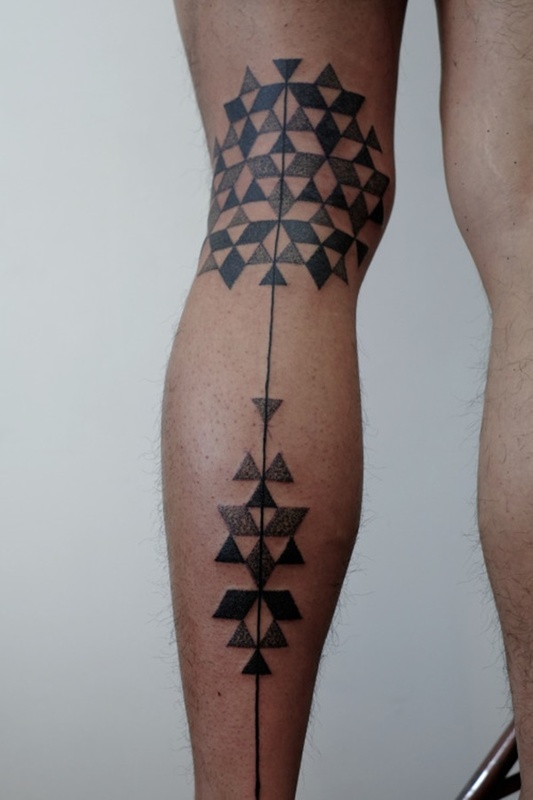 Black ink is used to create the image of a mandala with a triangle wrapped around an all-seeing eye in this tattoo shown on the wearer’s left thigh. 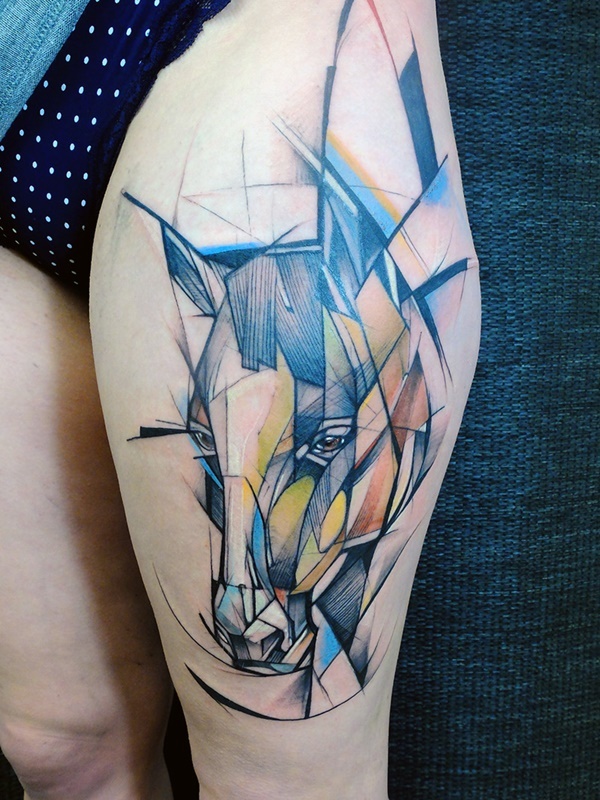 A fragmented horse, pictured on the wearer’s left thigh, is colored using an earthy color palette and bold, black lines. 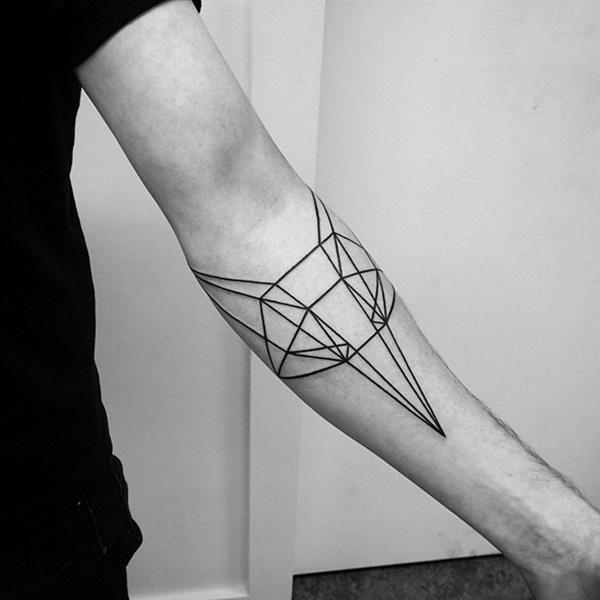 Rhombuses and triangles are grouped around a center line that runs down the wearer’s forearm in this black and gray tattoo. 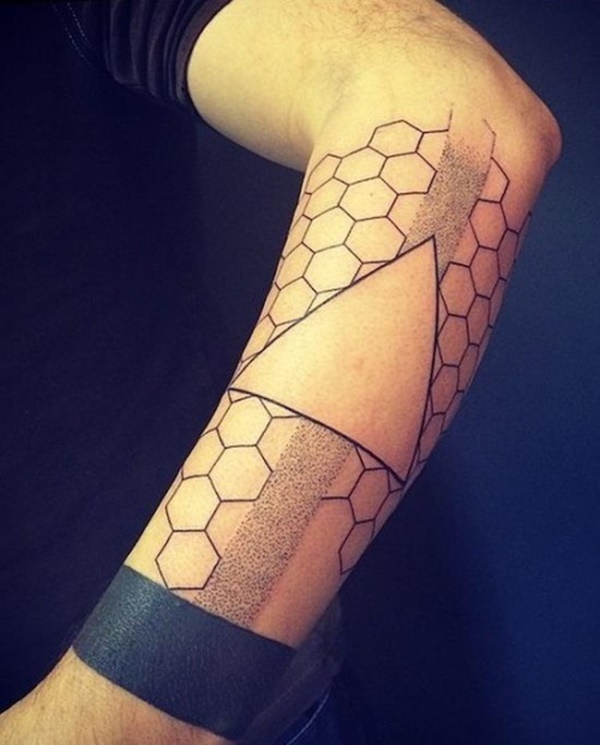 Hexagons create a honeycomb background and the pattern is embellished with a triangle, a line of black dots, and a black band wrapped around the wearer’s wrist. 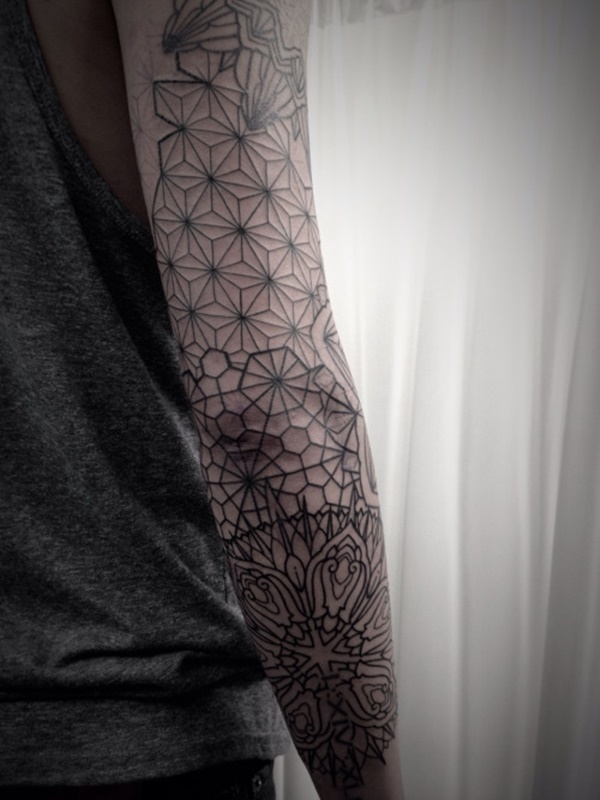 A lotus flower is centered in the middle of an absurdly detailed pattern in this black pair of forearm tattoos. 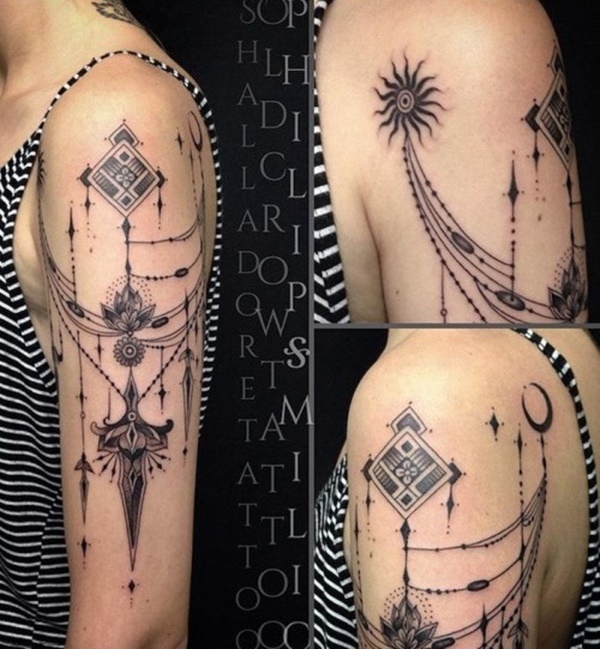 This black and gray tattoo shows dangling sets of beads adorned with shining stones on the wearer’s bicep. A lotus flower is embellished with dangling beads in this black back piece. 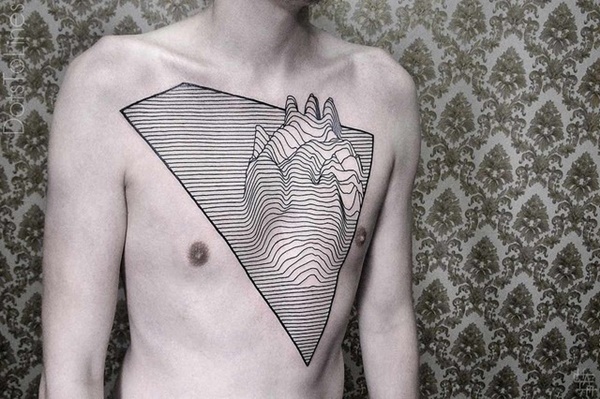 A geometric chest piece is surrounded by thick, black lines on the wearer’s chest and the bold lines descend down the wearer’s arms. 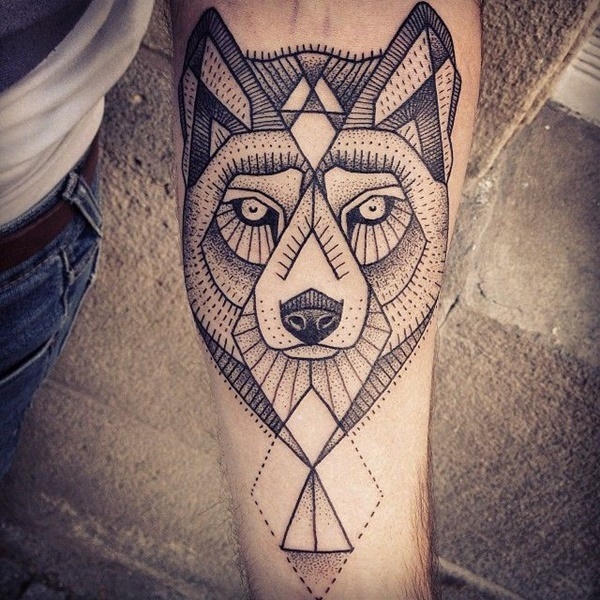 Black lines are used to create a fox out of simple geometric shapes. 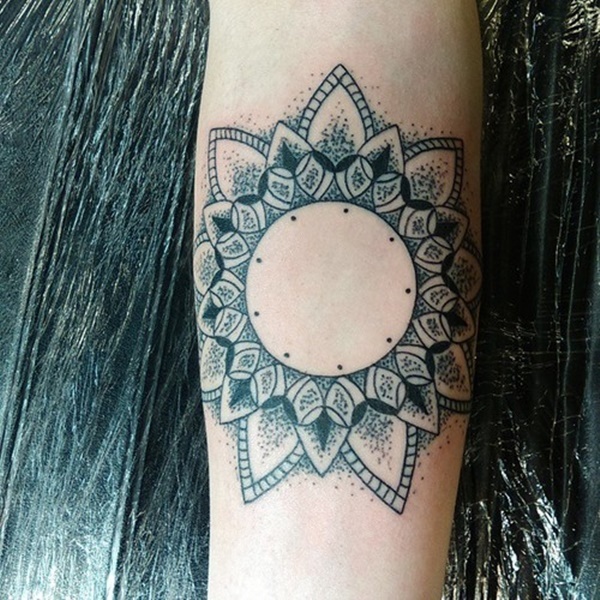 A circle creates the centerpiece for a mandala in this black and gray forearm tattoo. 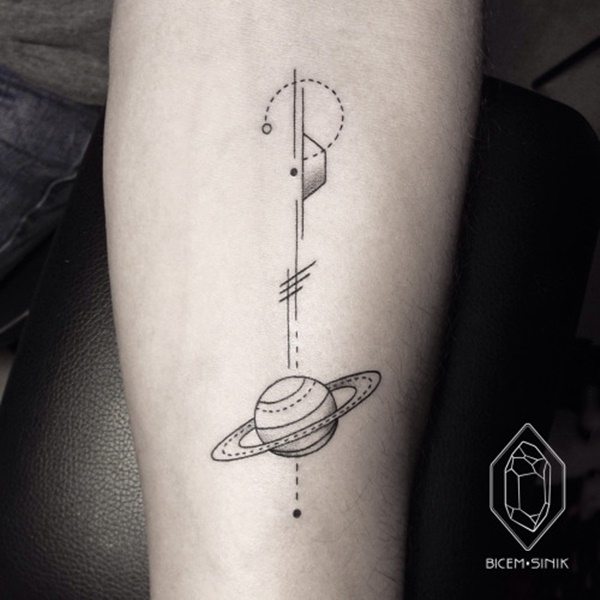 Simple shapes and lines lead to a planet surrounded by a ring like the planet Saturn. 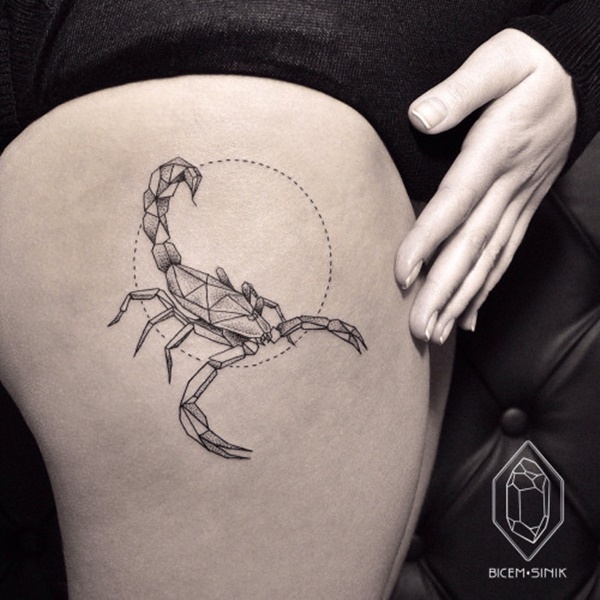 This black and gray thigh tattoo depicts a scorpion, composed of geometric shapes, over top of a circle created with a perforated line. 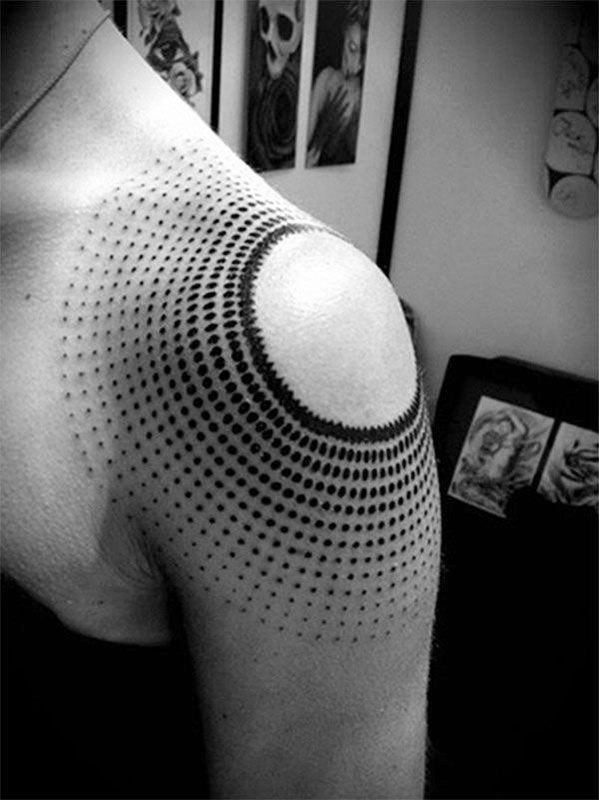 Black lines sport black circles at the ends and are laid over top a series of small dots on the wearer’s left forearm. 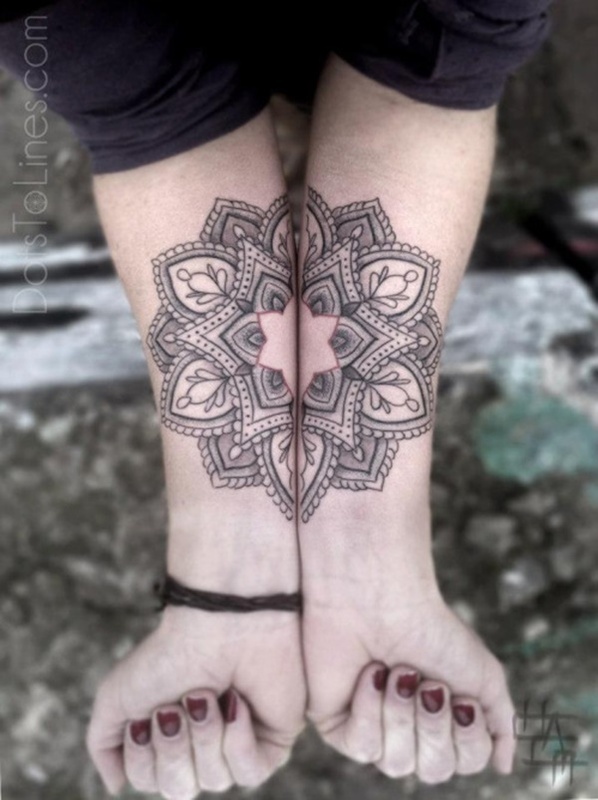 Black mandala inspired bands wrap around the wearer’s wrists in this tattoo set. 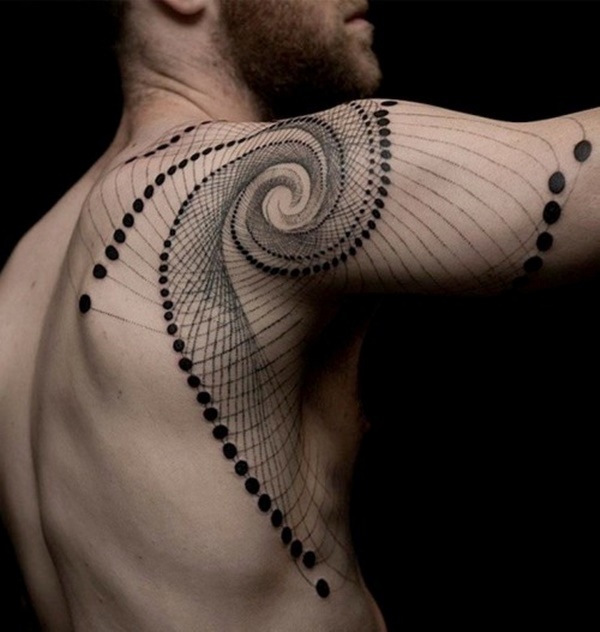 A combination of lines and circles swirl into a whirlpool in this back and arm piece. 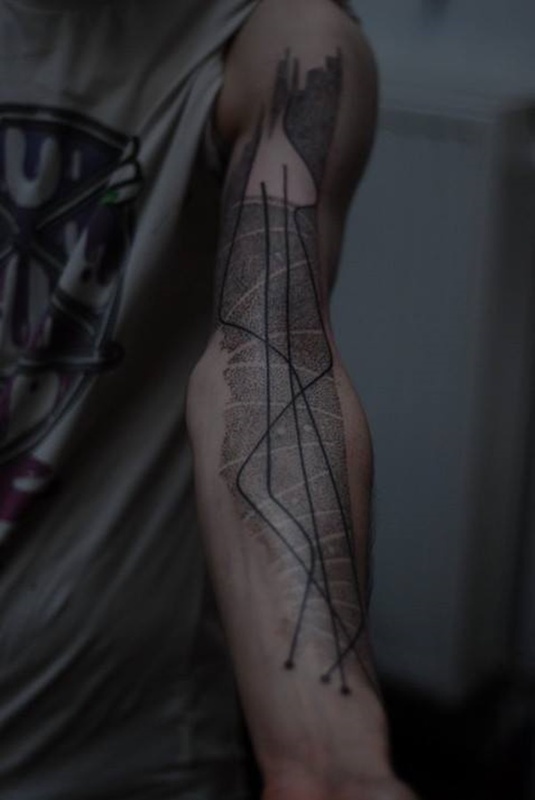 Black line are used to create a fragmented mountainscape inside of a circle in this forearm tattoo. 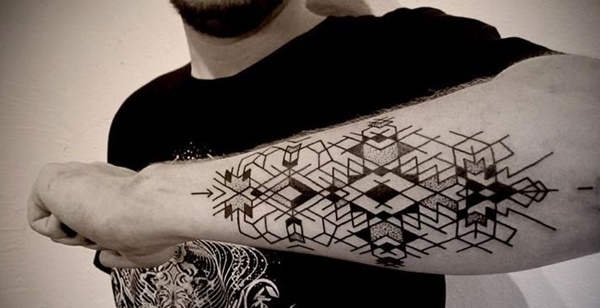 A myriad of shapes and patterns are composed of black ink to create this 3/4 length sleeve. 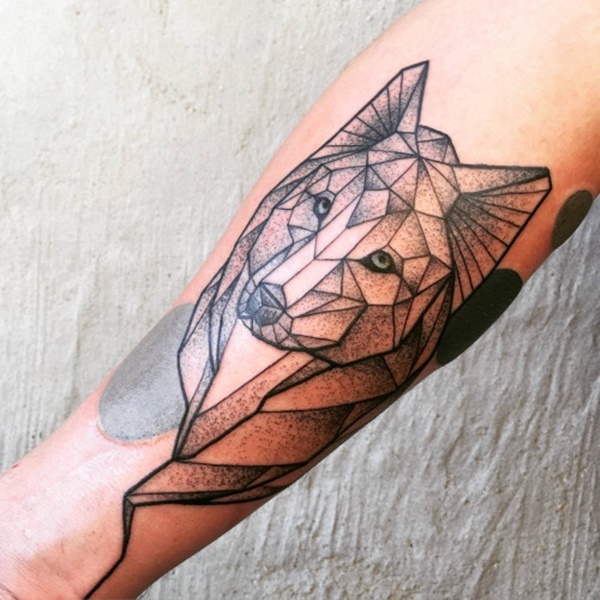 Another example of a wolf created using geometric shapes, this tattoo is shaded with black dots and the eyes are colored with a pale shade of blue. 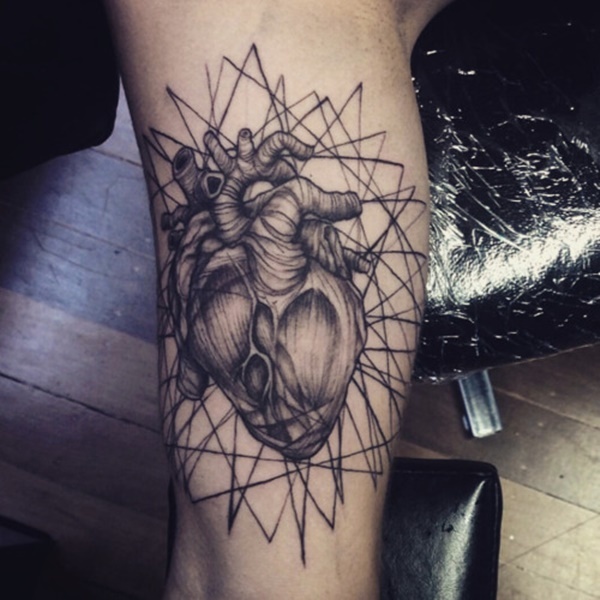 This black and gray tattoo, pictured on the wearer’s shin, shows a realistic heart depicted over a series of scribbled lines. 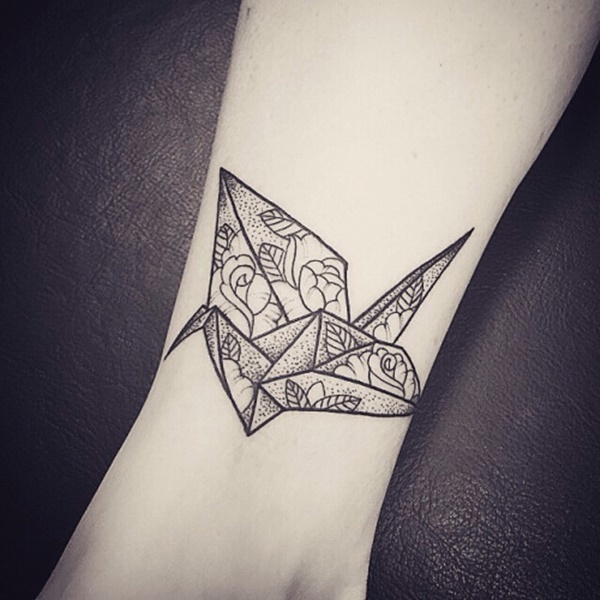 This adorable piece shows an origami swan adorned with a floral pattern and small black dots. 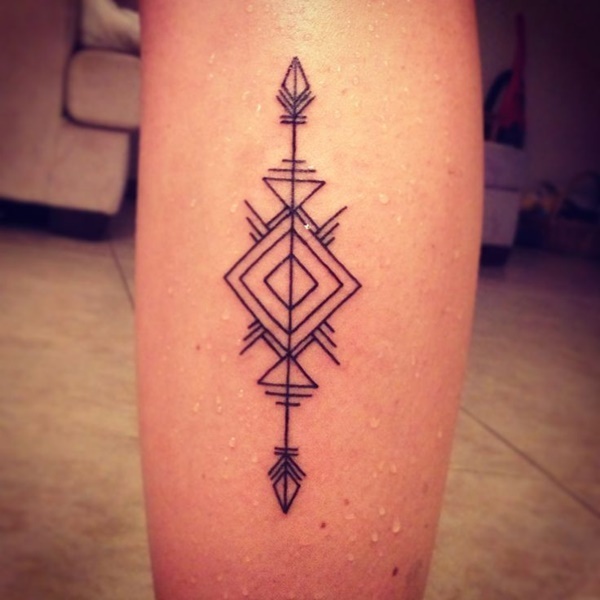 A simple depiction of a bow and arrow is created using geometric shapes in addition to precise and perforated lines. 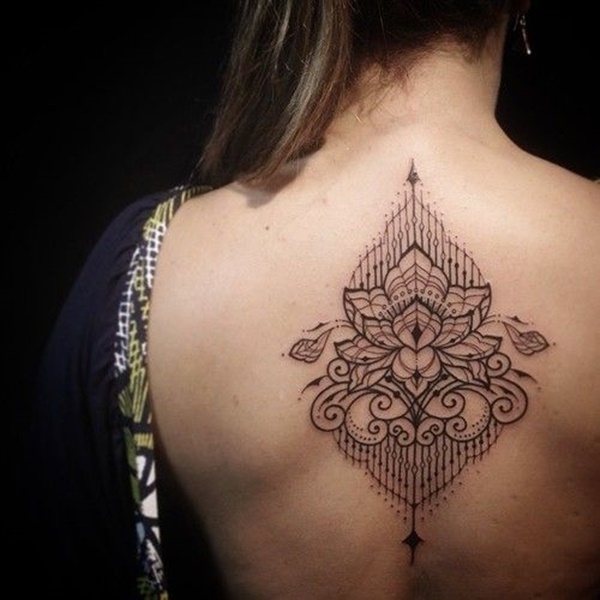 A mandala inspired back piece leads to a flower on the wearer’s spine and the pattern wraps up around the wearer’s shoulders. 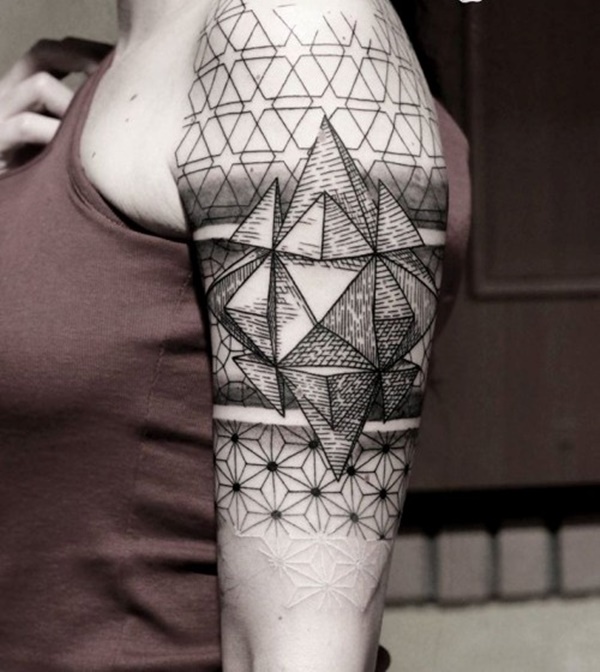 Black ink is used to create this tattoo, shown on the wearer’s bicep, depicting a series of pyramids laid over top a pattern of geometric shapes. 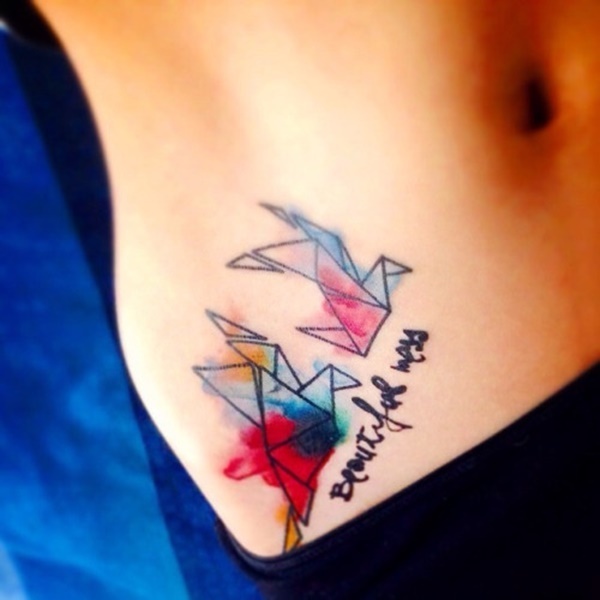 Origami swans are colored with a vivid smear of watercolor and the quote, “beautiful mess,” is scrawled underneath. 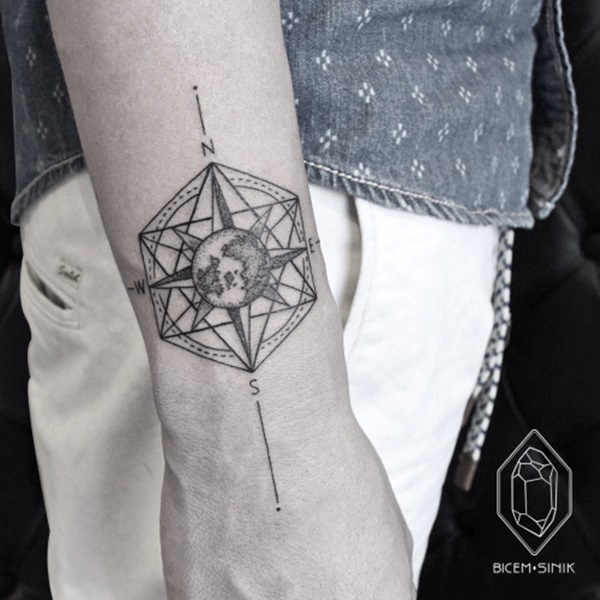 A compass is inked onto the wearer’s wrist and the earth is laid over top the center of the compass. 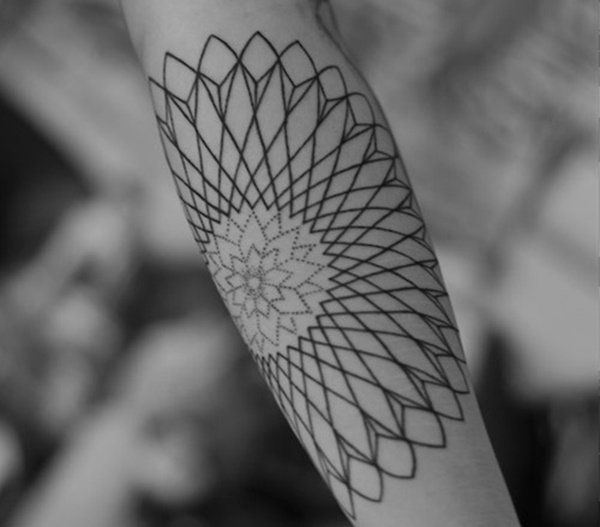 A lotus flower is centered in the middle of this black and gray tattoo and overlapped by a series of interwoven circles. 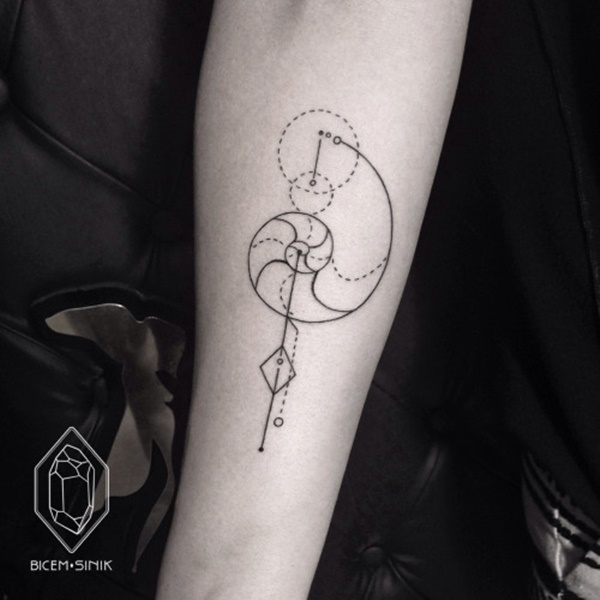 A swirled shape is the centerpiece of this black forearm tattoo. 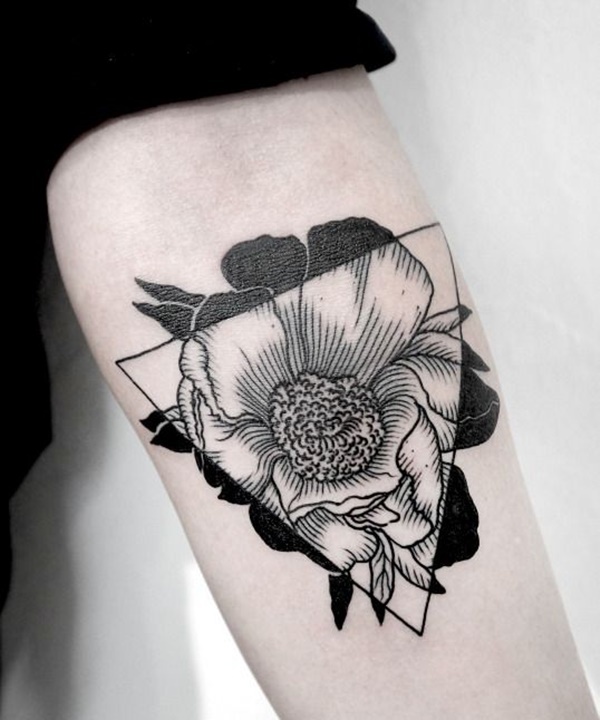 A well-shaded black and gray flower is shown on the wearer’s bicep. The piece incorporates heart shapes into the design and the center of the flower displays a multi-faceted gemstone.